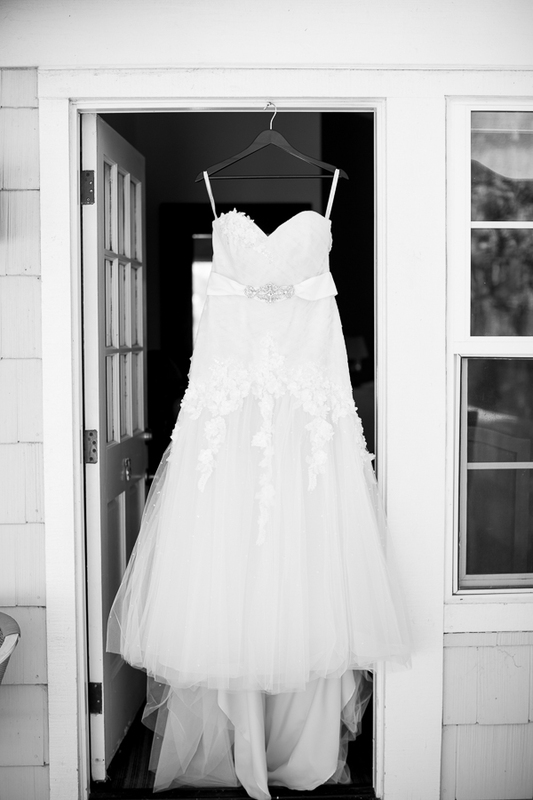 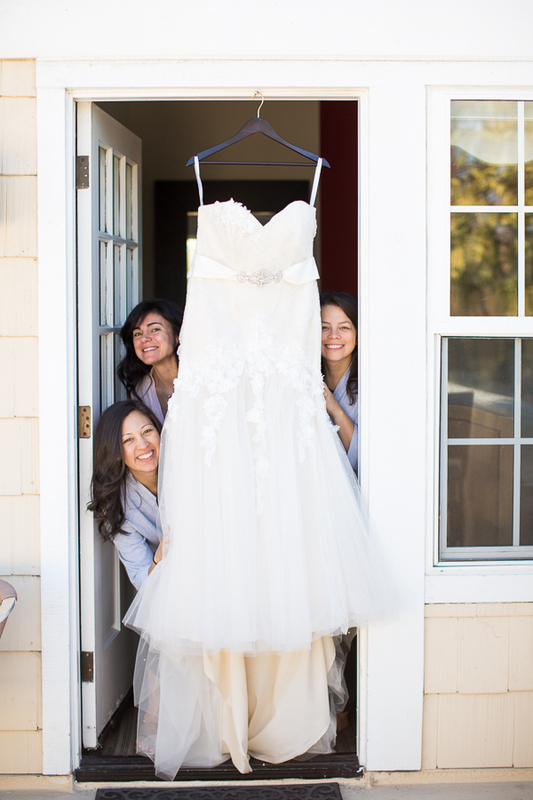 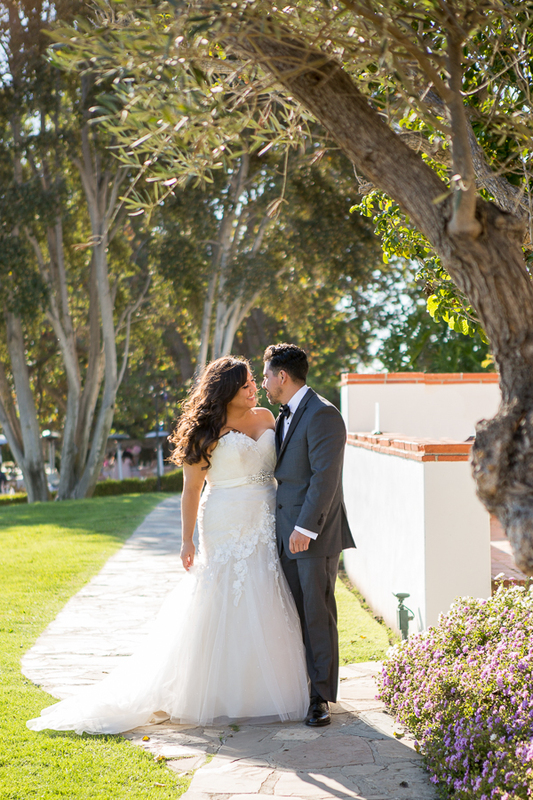 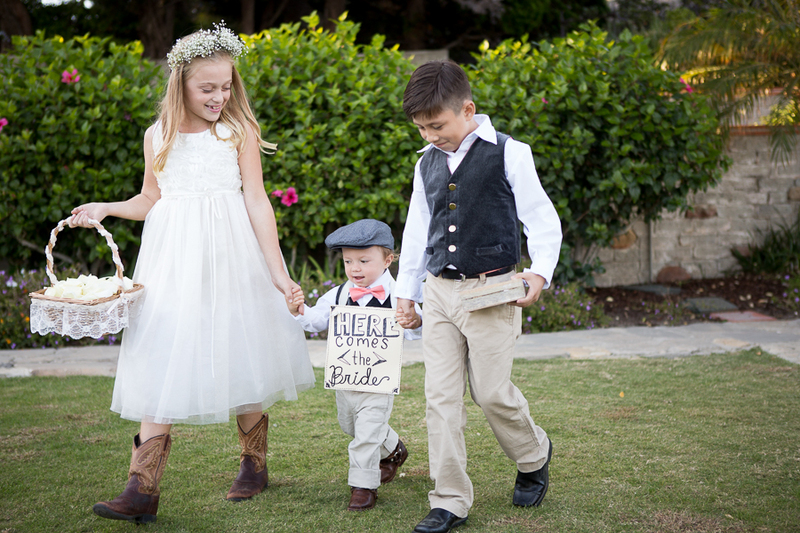 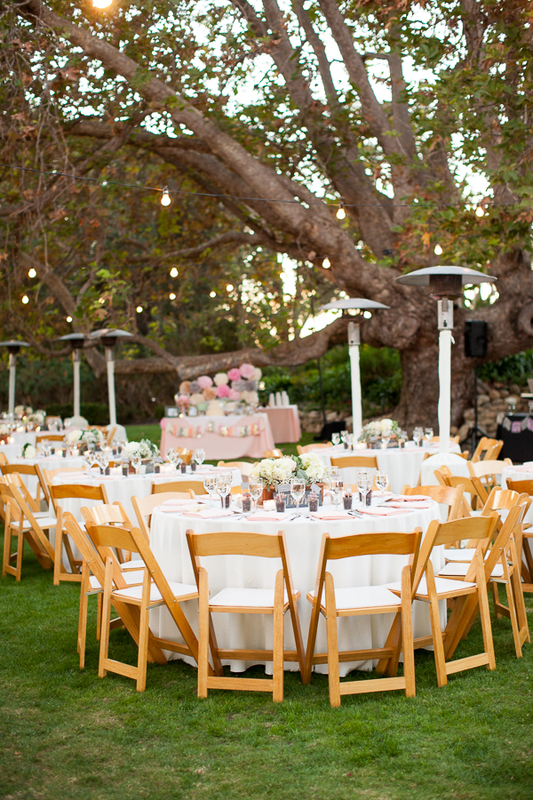 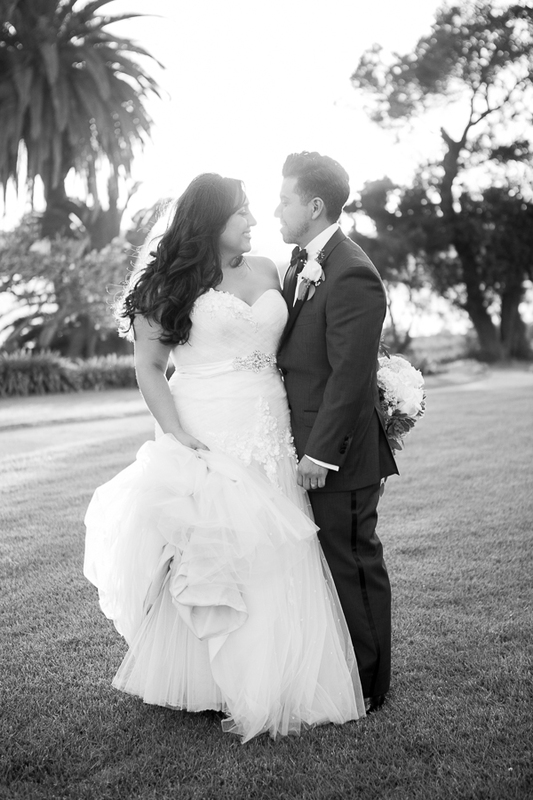 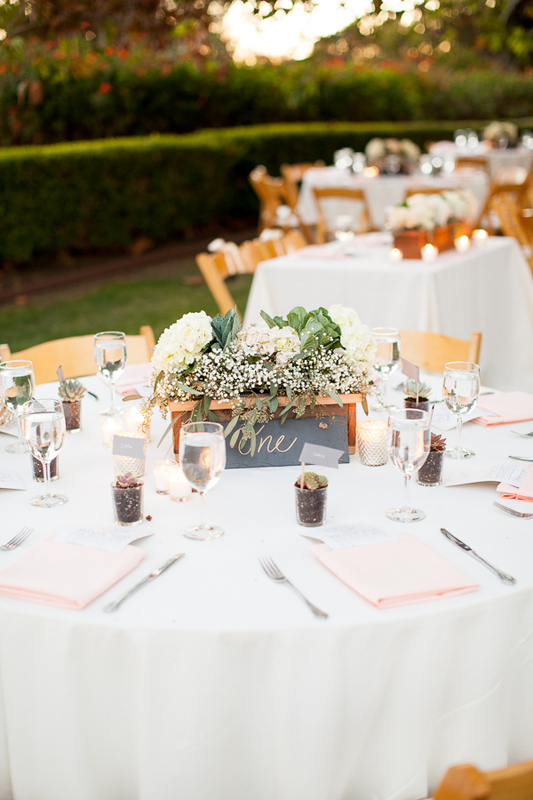 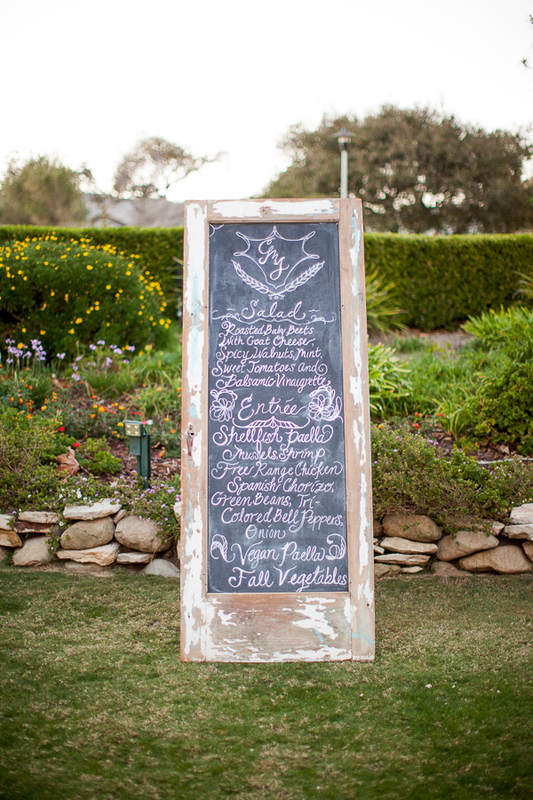 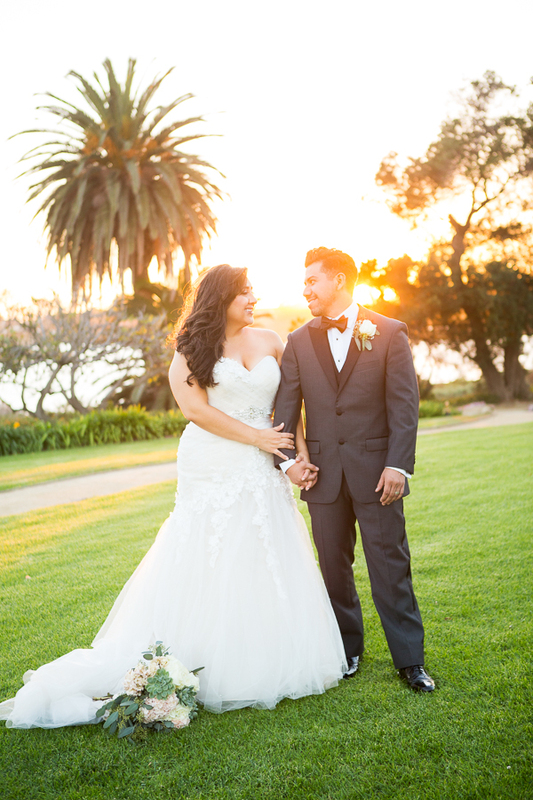 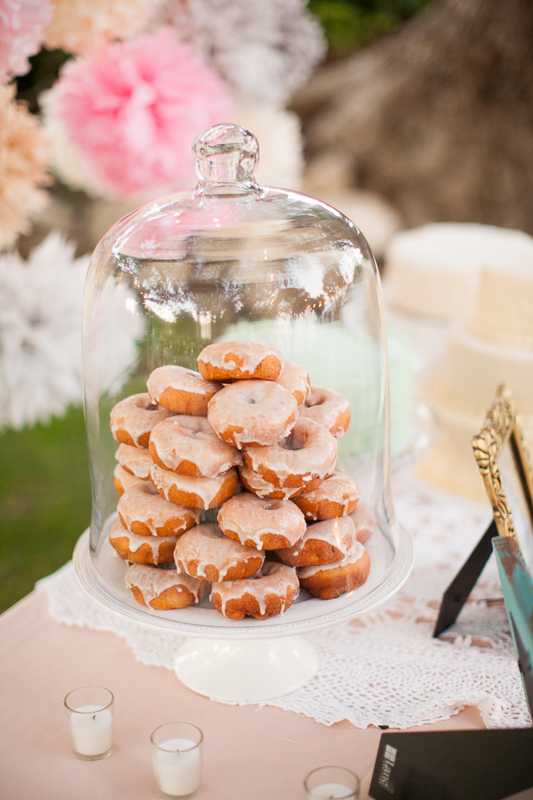 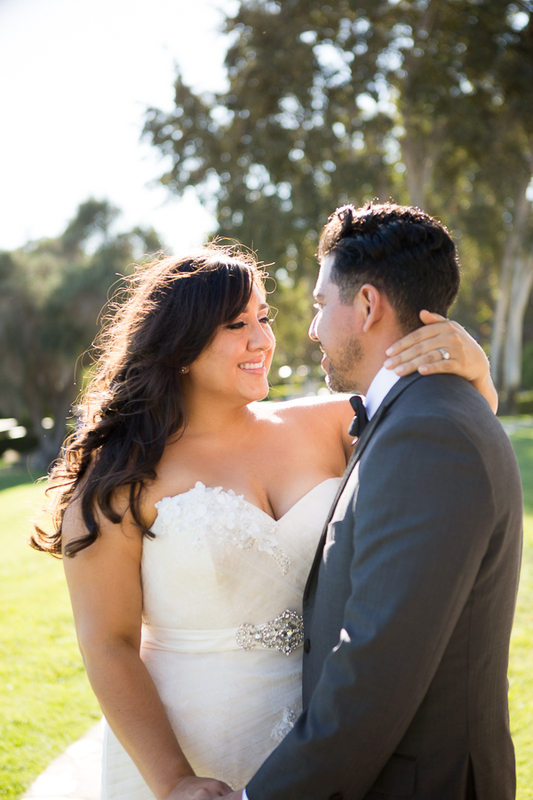 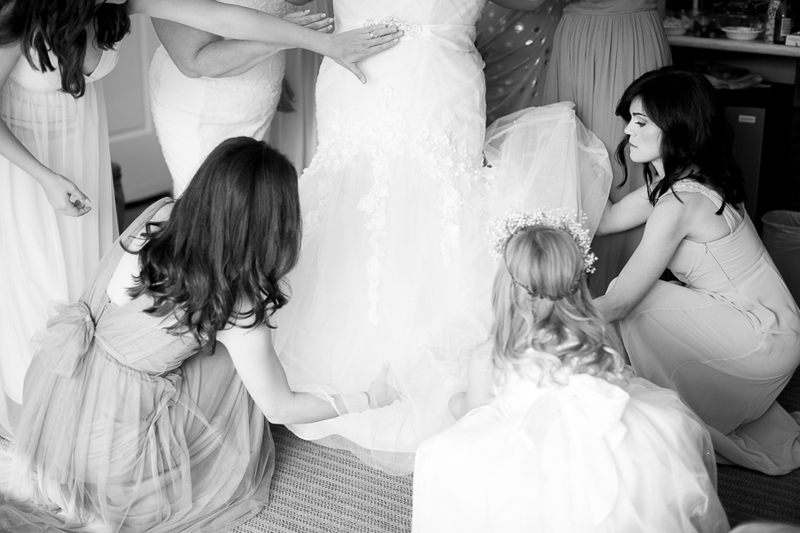 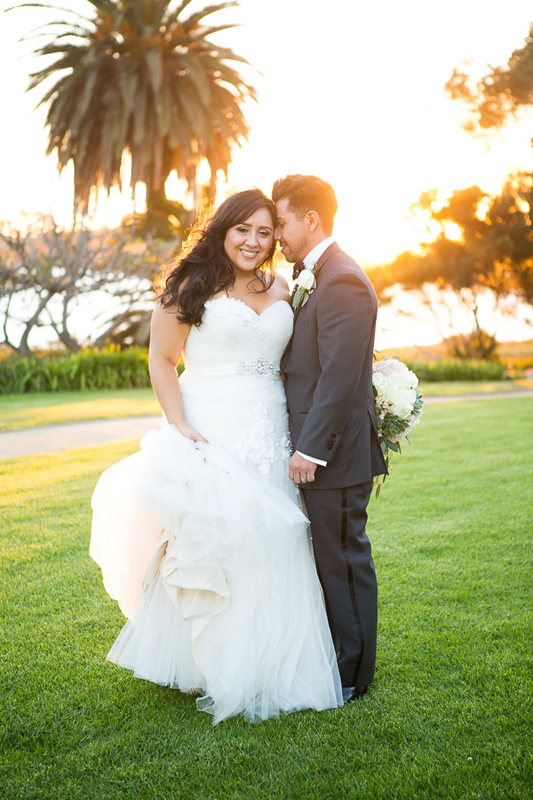 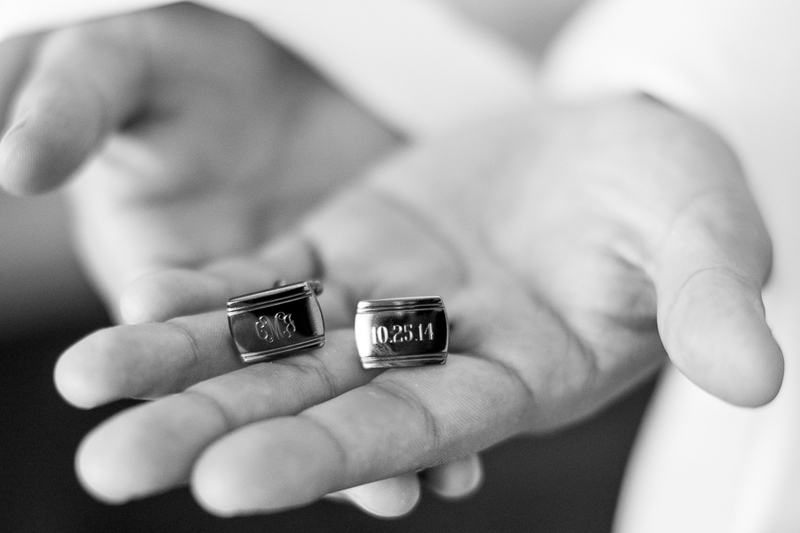 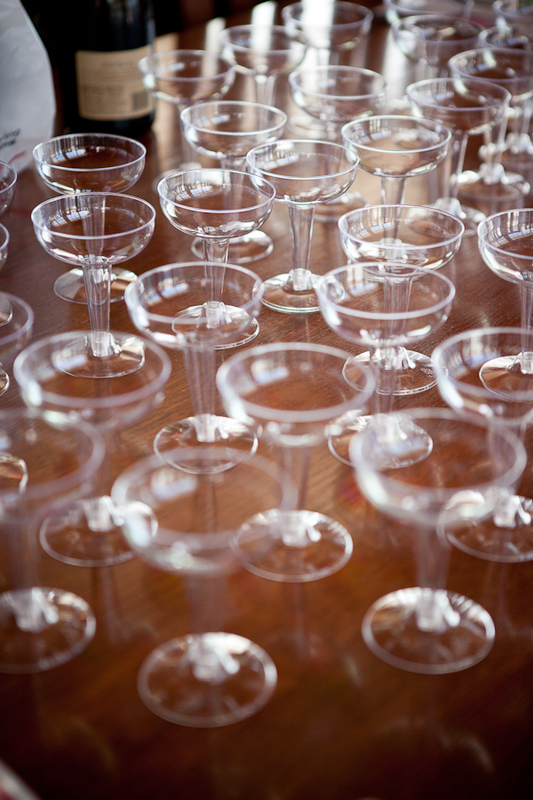 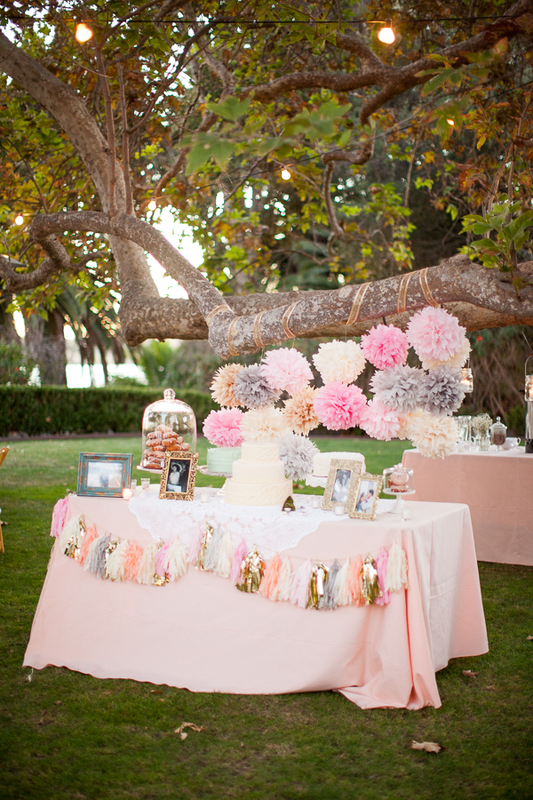 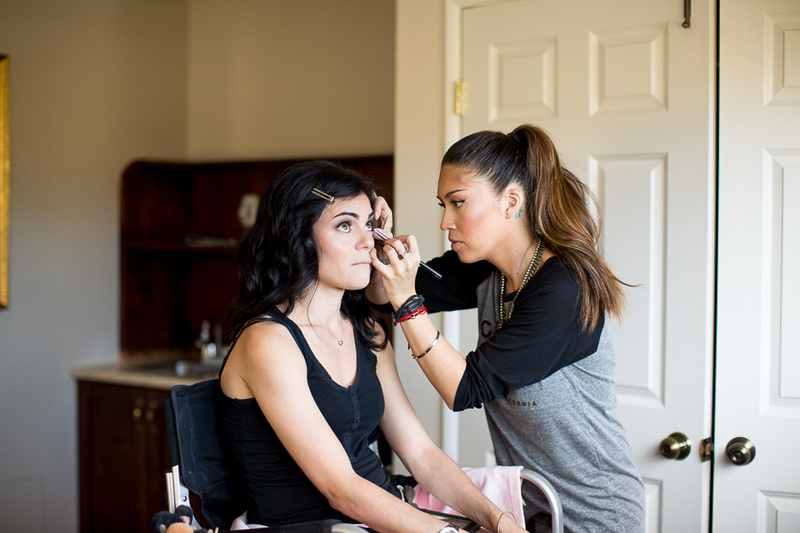 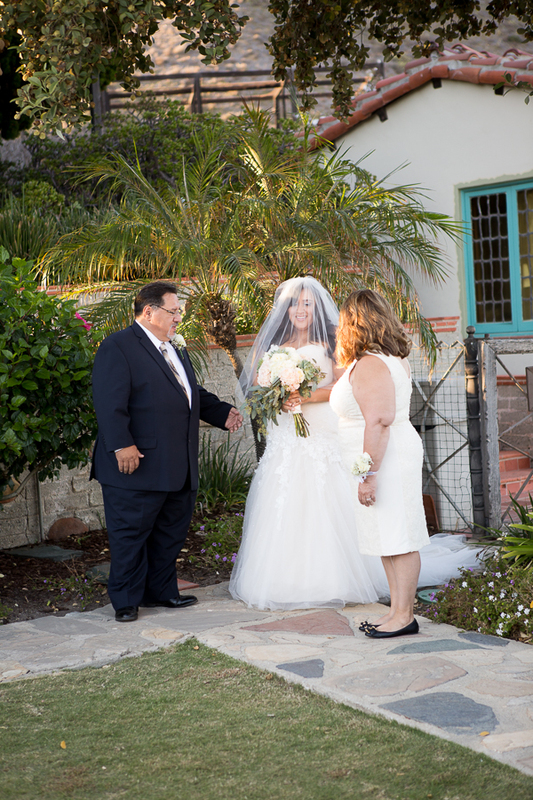 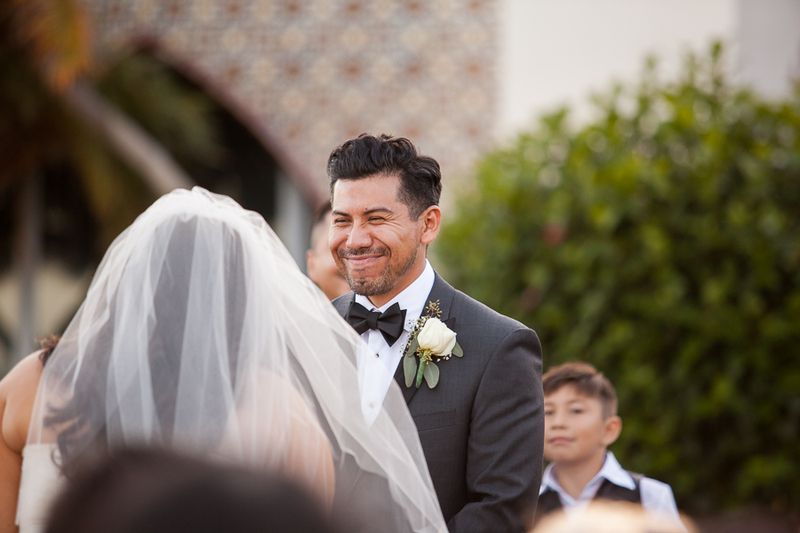 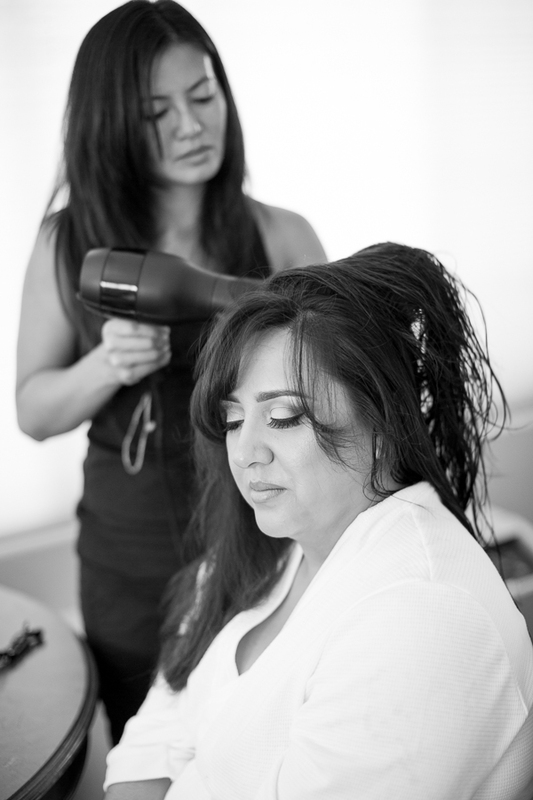 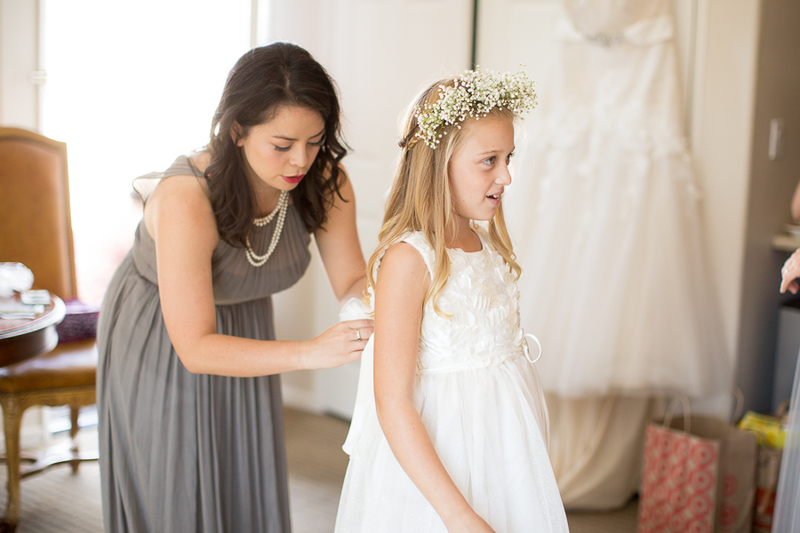 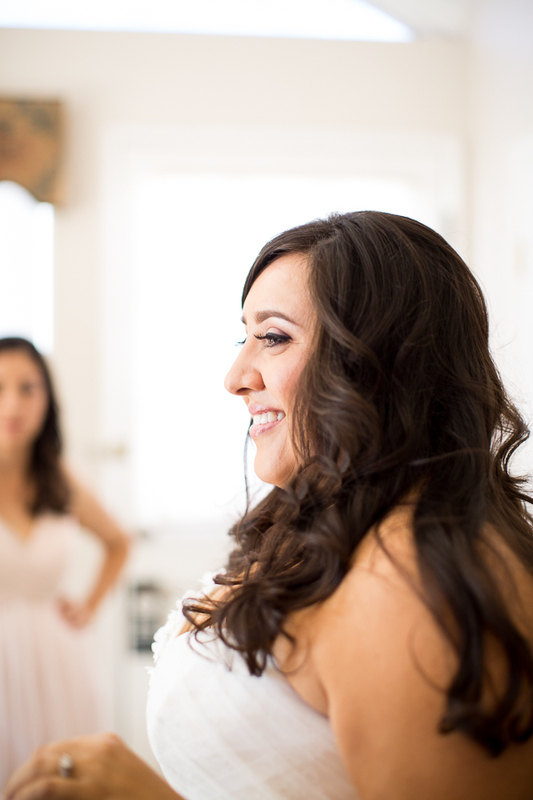 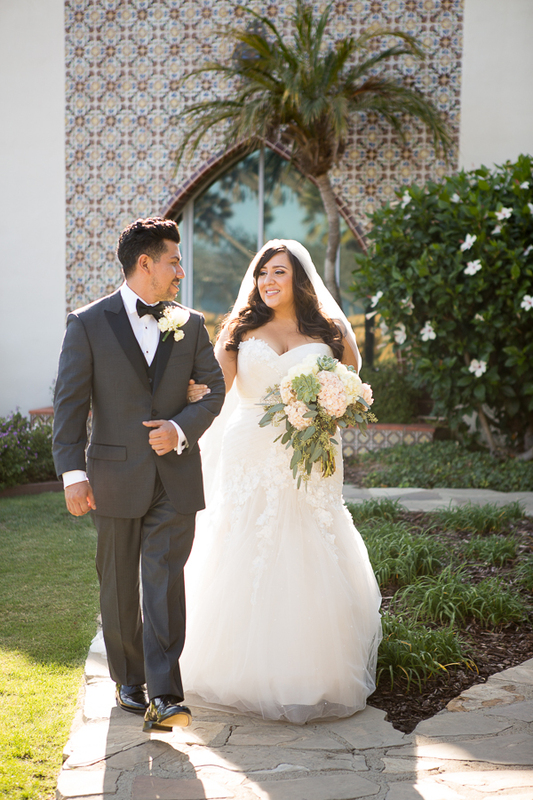 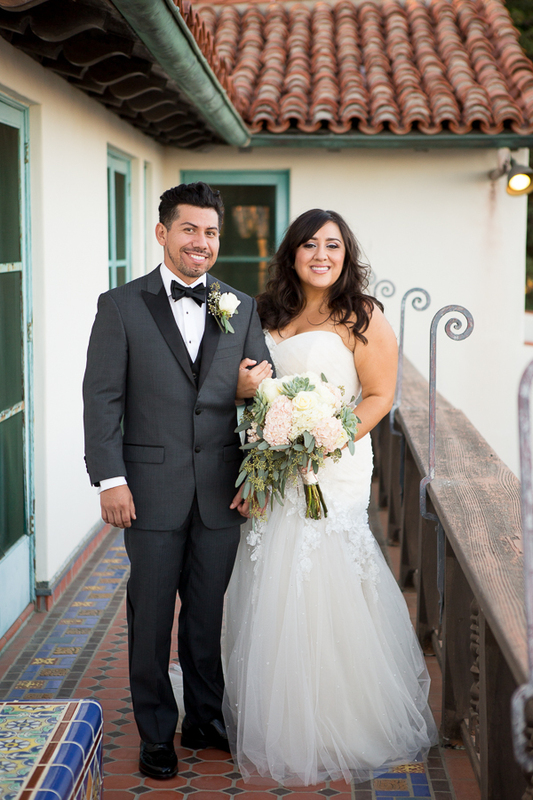 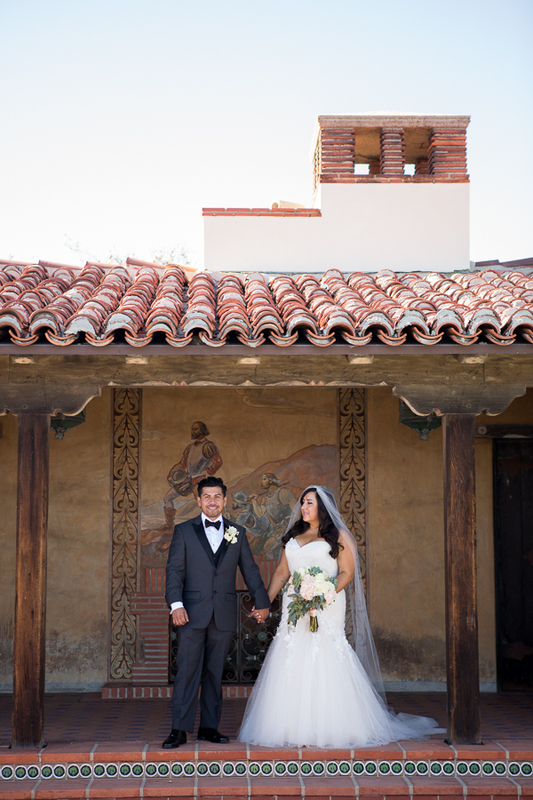 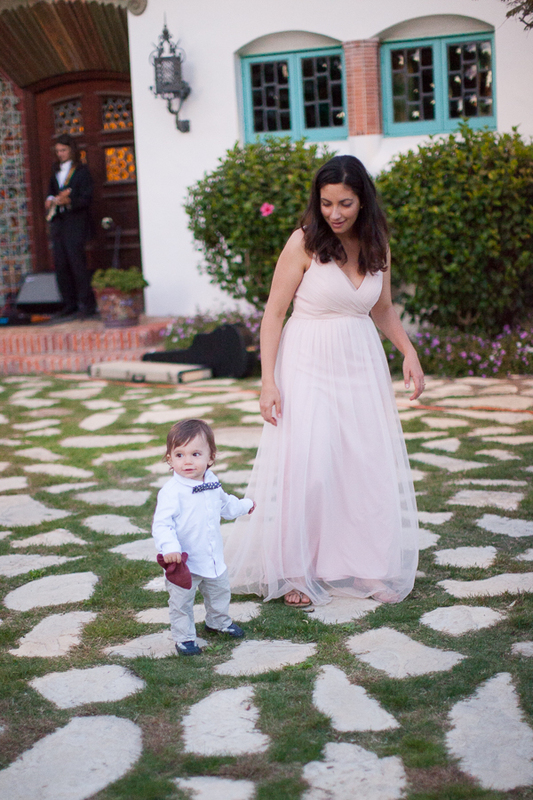 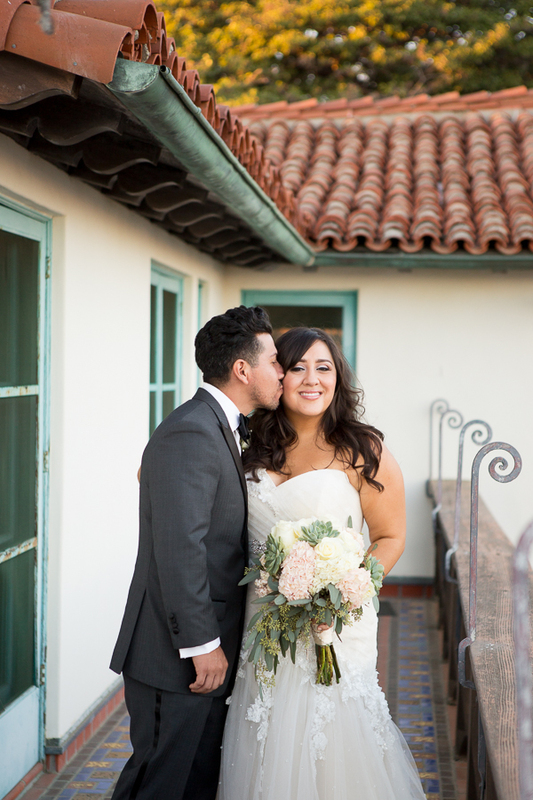 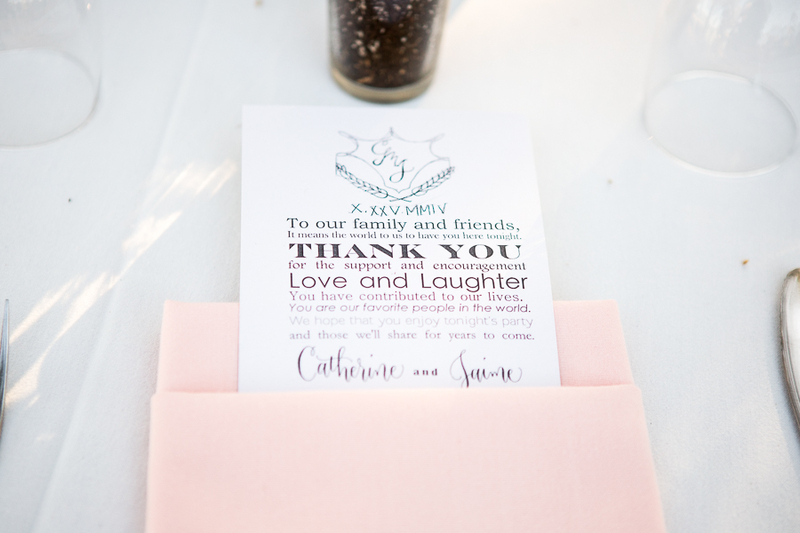 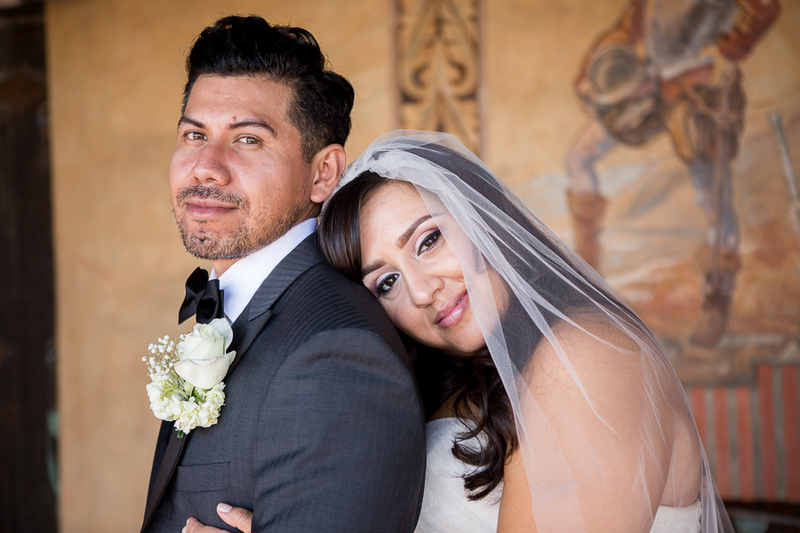 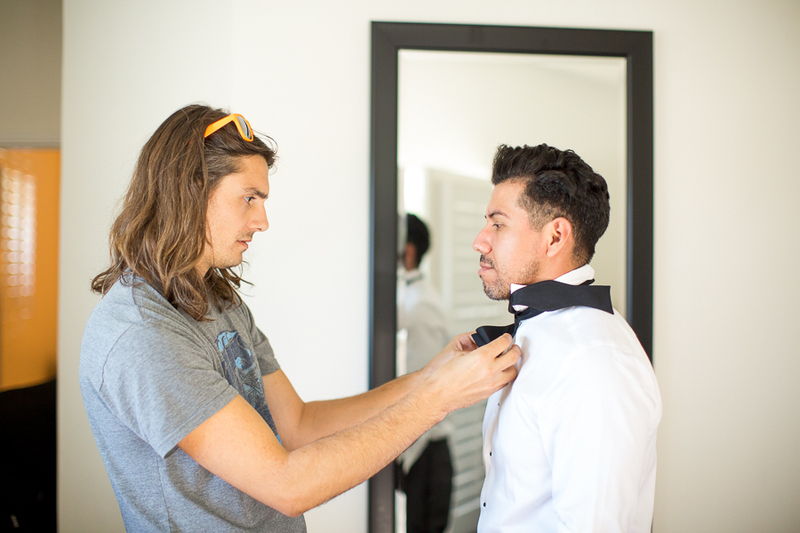 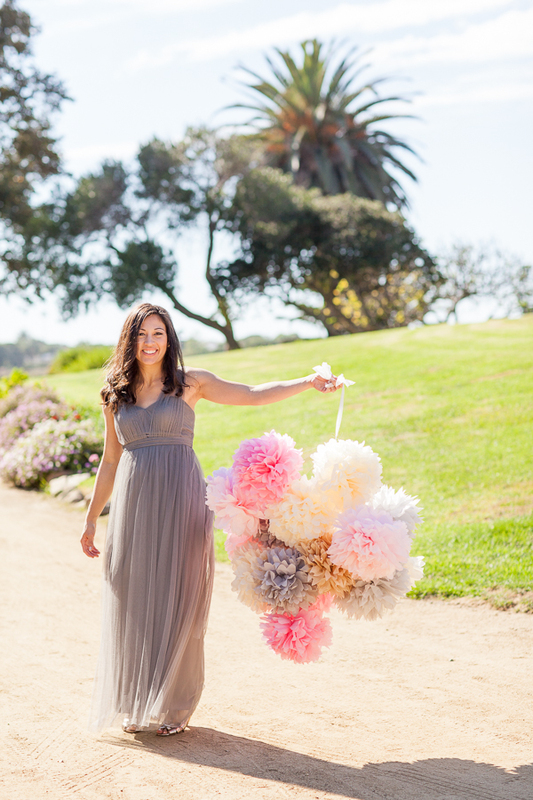 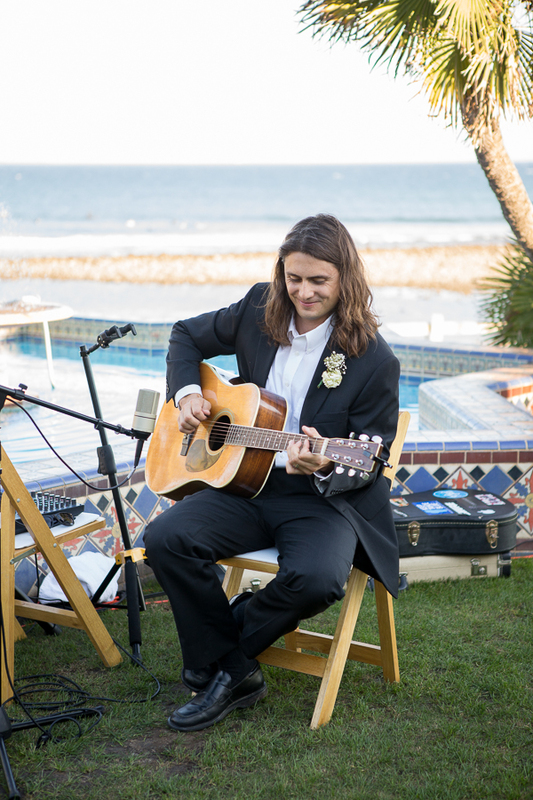 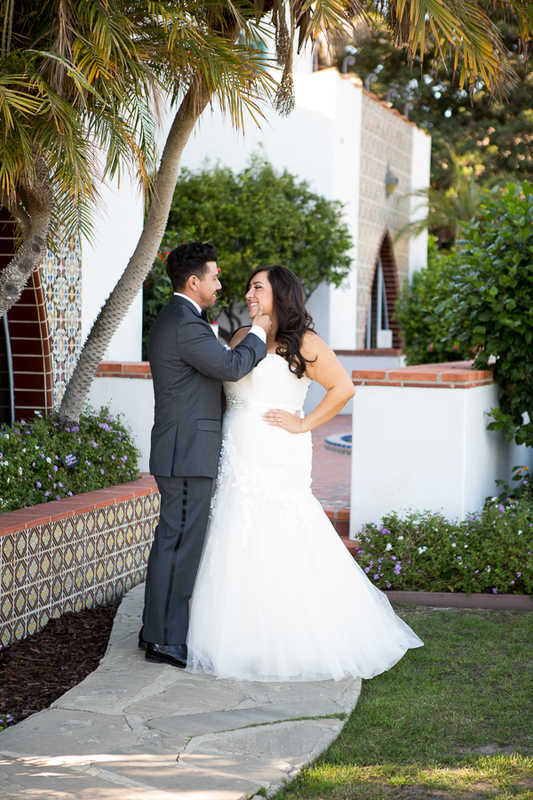 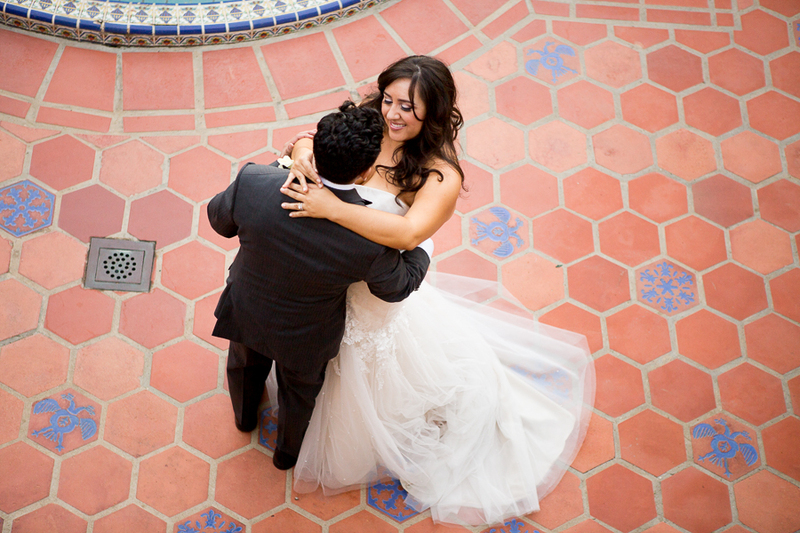 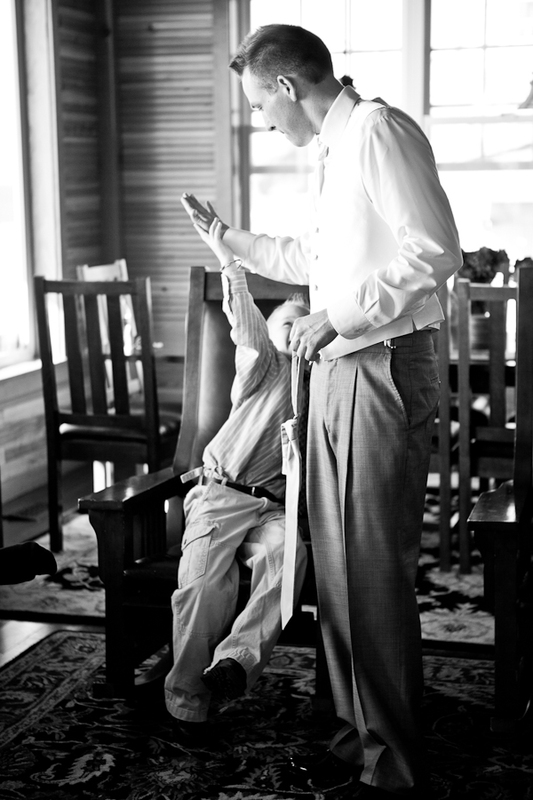 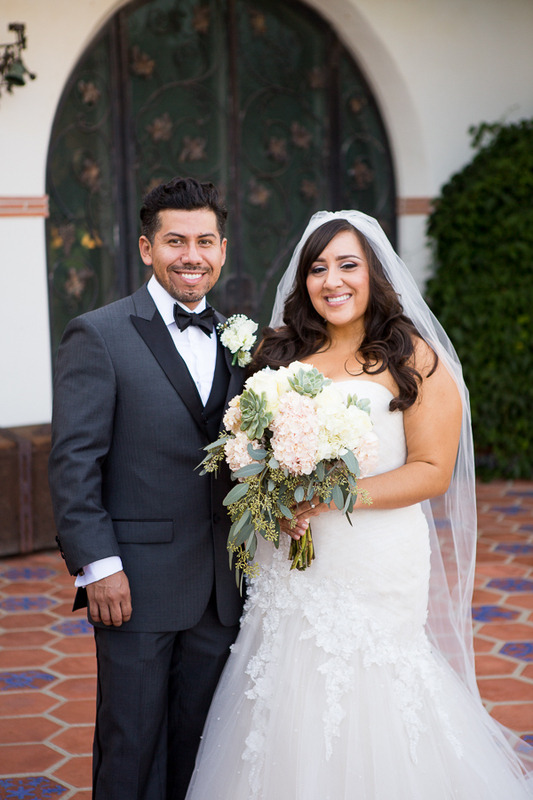 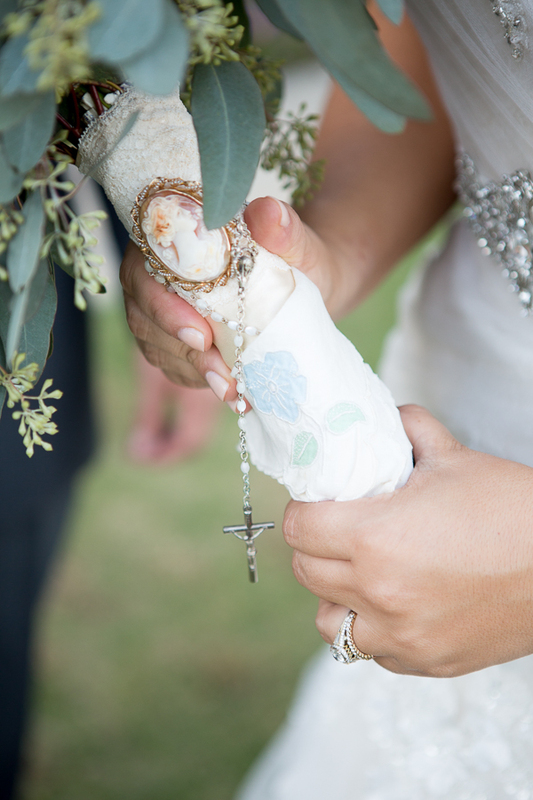 Catherine and Jaime were married at the gorgeous Adamson House in Malibu, California. 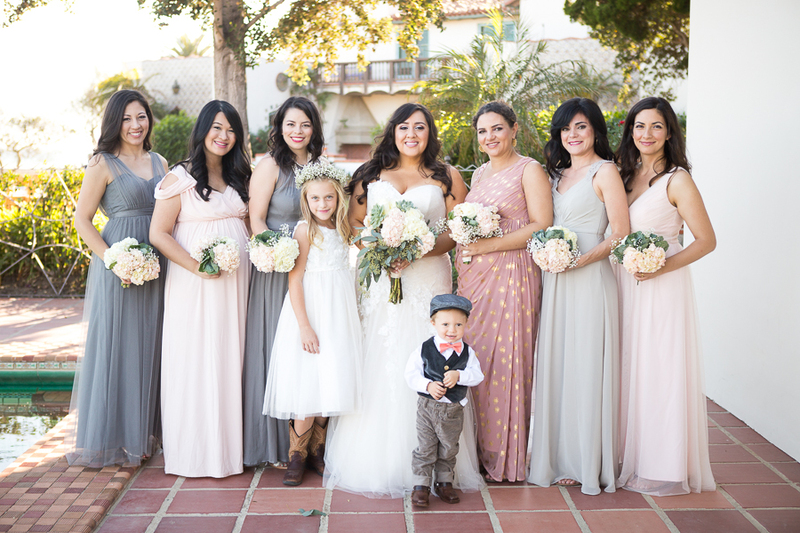 I started taking pictures with the bridesmaids and Catherine at the Malibu Country Inn as they got dressed and put the finishing touches on all of the hand-made details (the poms and decorations for the dessert table, the bouquets and the reclaimed wood flower boxes that served as centerpieces, and the re-purposed chalkboards for all the signs and menus), then I headed over to the Adamson House with Catherine and Jaime for their first look and a few early portraits. 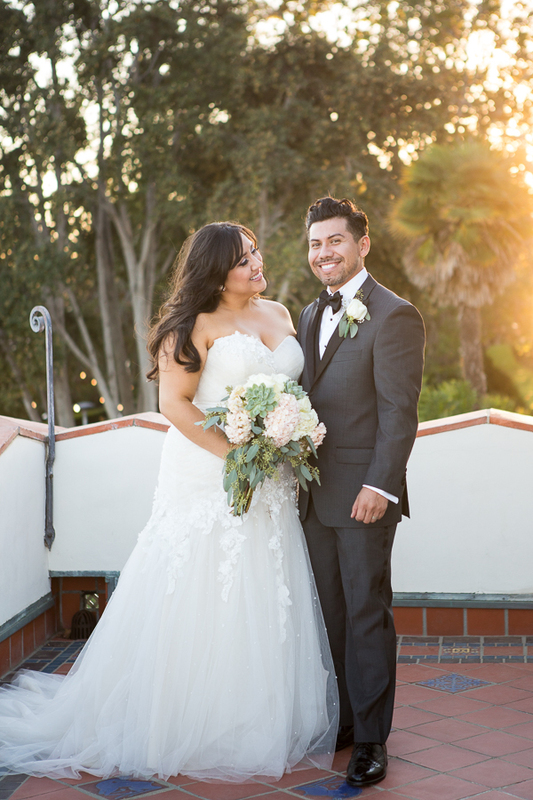 Catherine looked absolutely beautiful, and Jaime could have been pulled from the pages of a magazine, and the way these two were smiling and laughing with each other it made my job pretty easy. 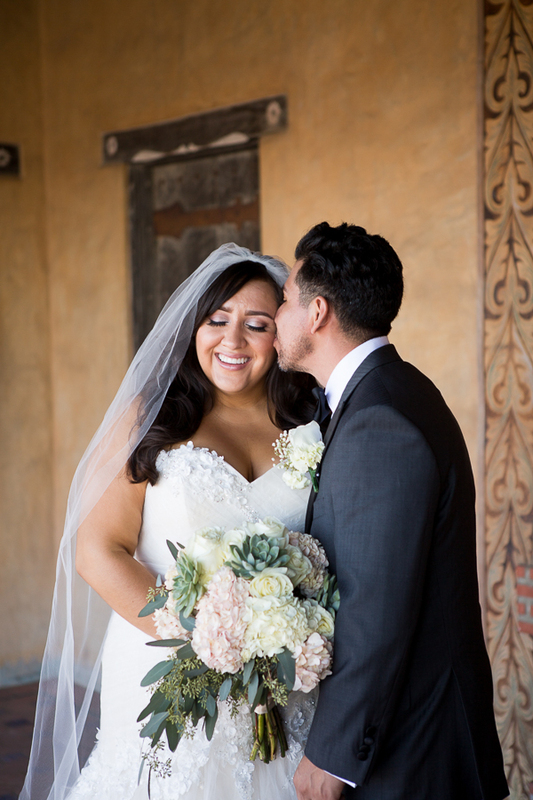 Jaime and Catherine’s first look reminded me why I love getting to photograph weddings, I get to be present for some of the most special moments of a couple’s day, and watching the two of them see each other for the first time (after a small delay to wipe away some happy tears) really warmed my heart. 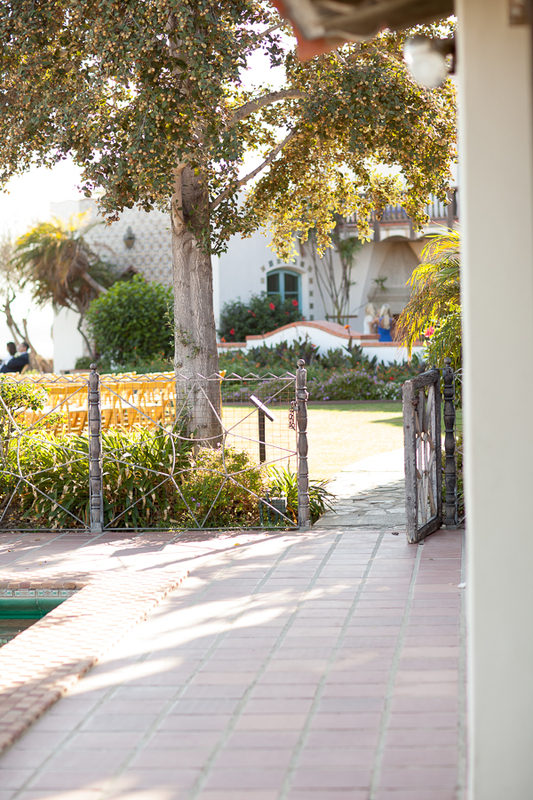 The Adamson House sits right next to the Pacific Ocean (right along the Pacific Coast Highway in Malibu) and has just stunning grounds, so it was really fun to get to explore the property and take lots of pictures among the historic buildings (with the beautiful colored tile and the incredible blue windowsills). 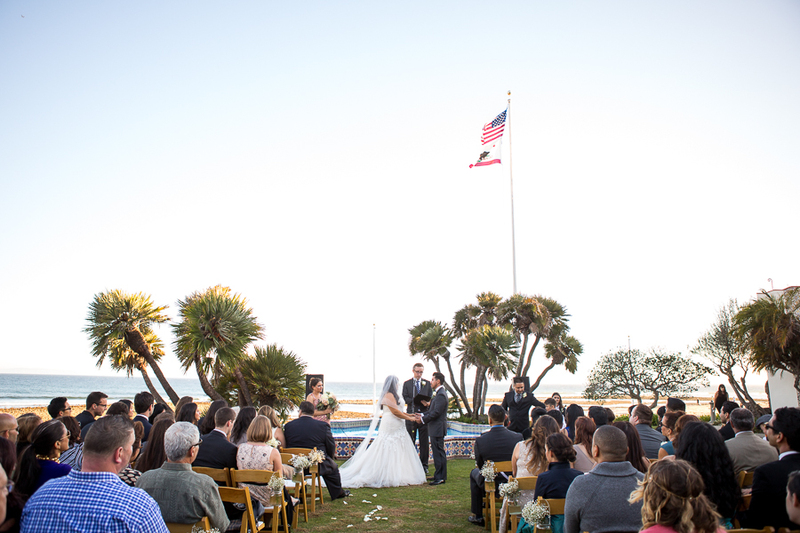 We could not have asked for a more beautiful fall day for a wedding! 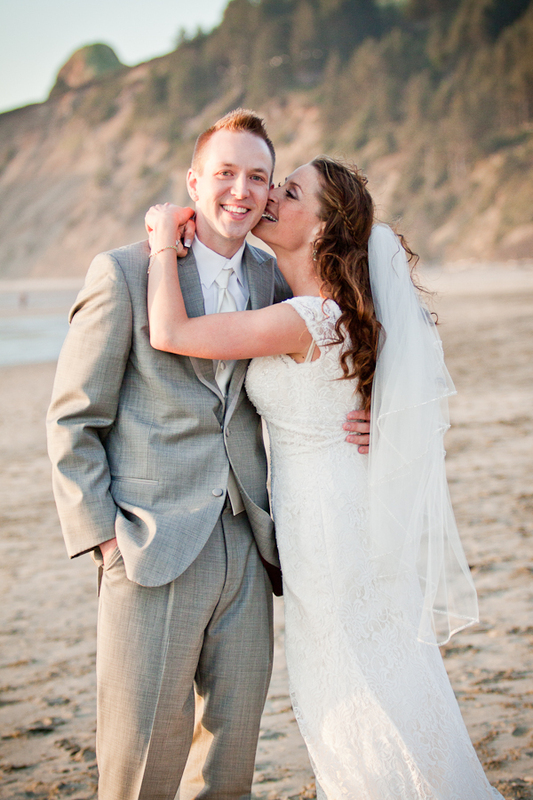 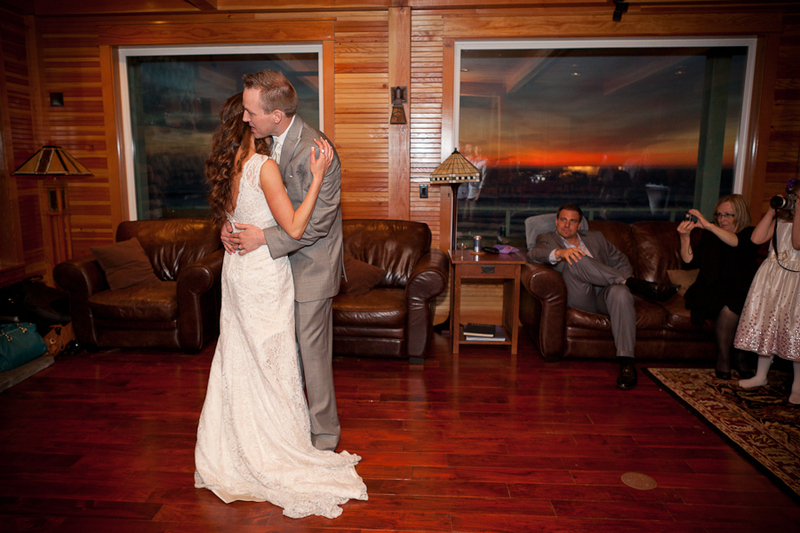 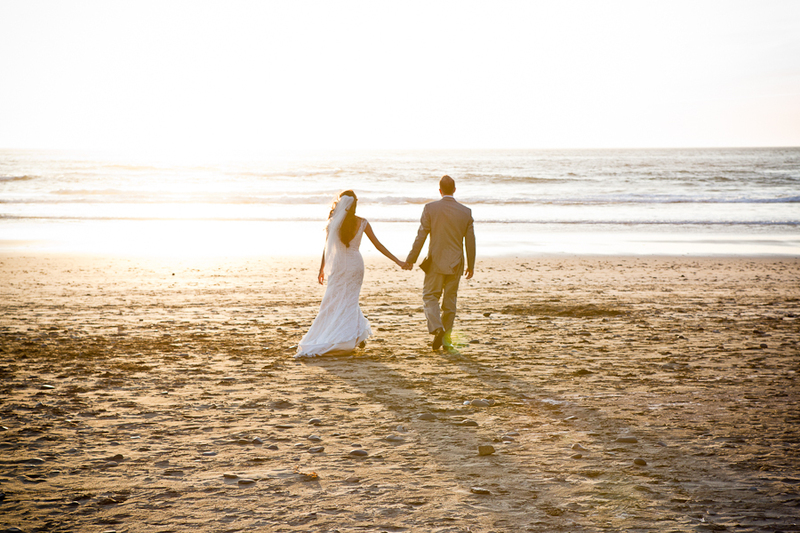 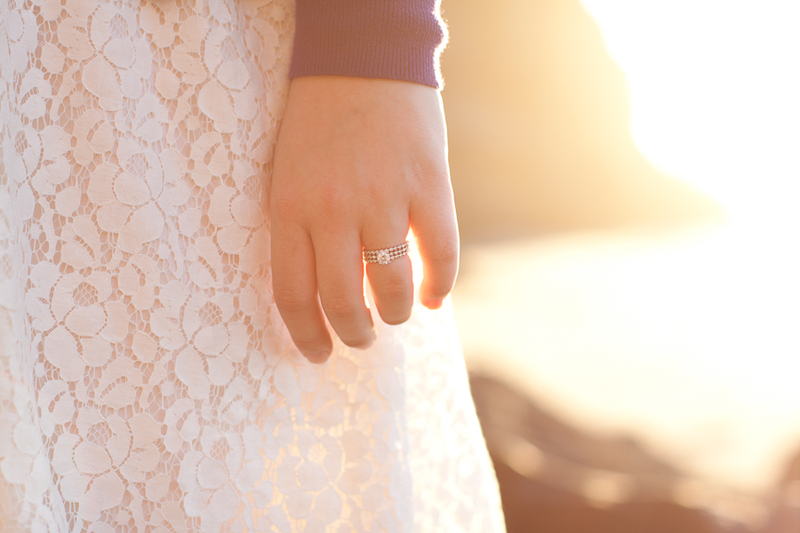 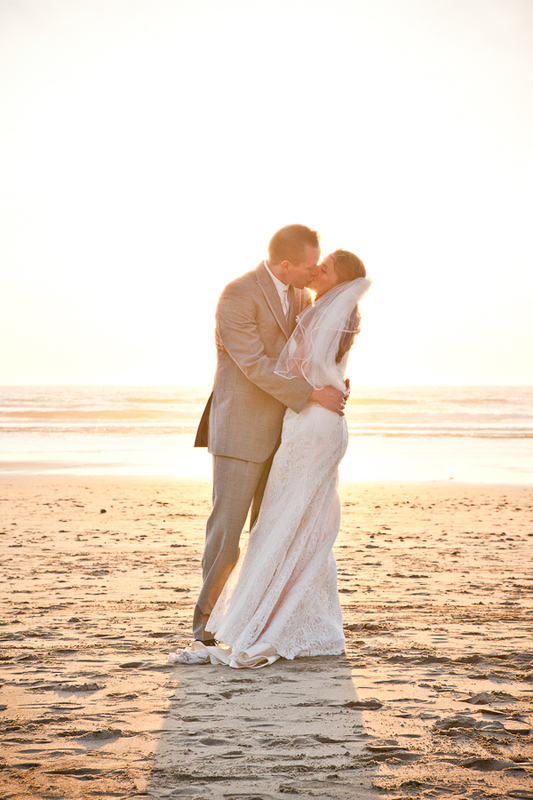 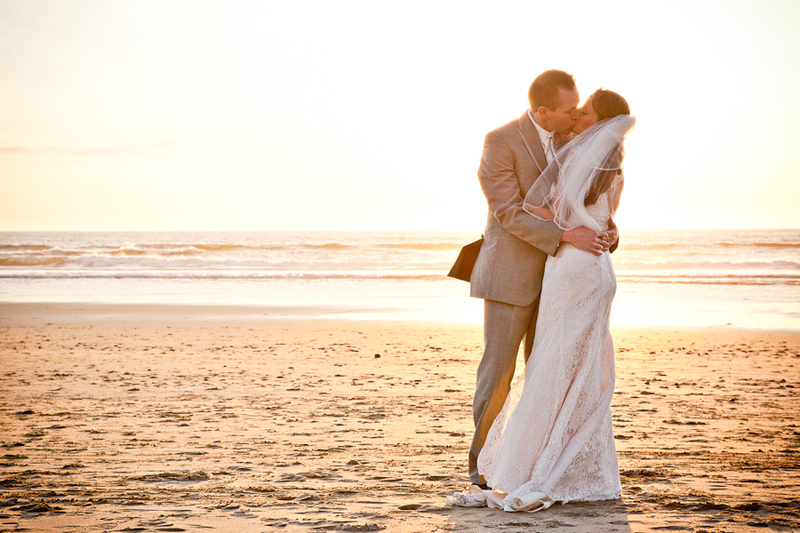 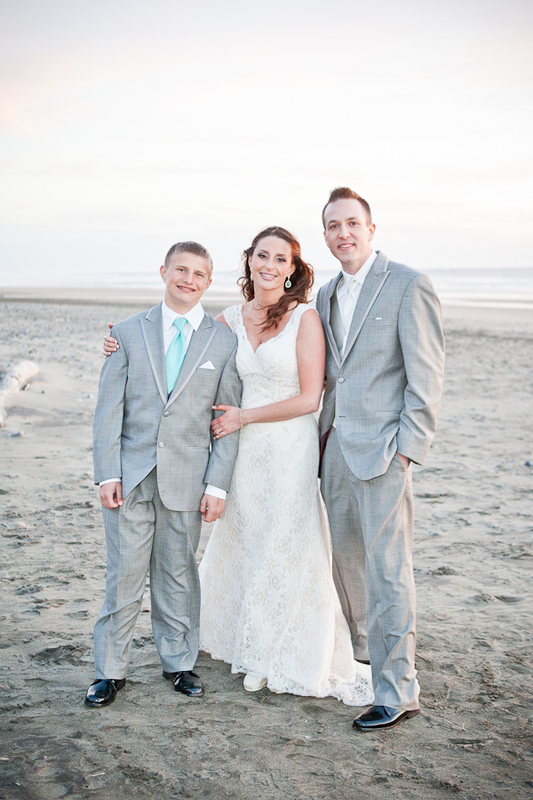 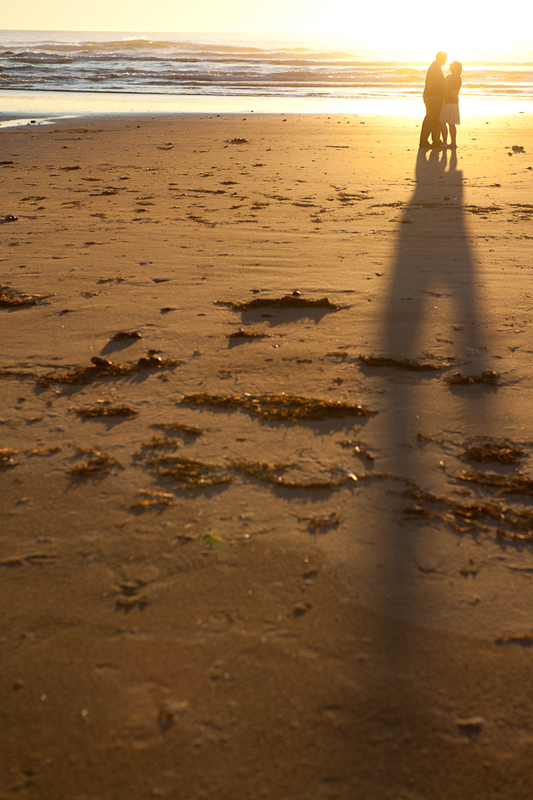 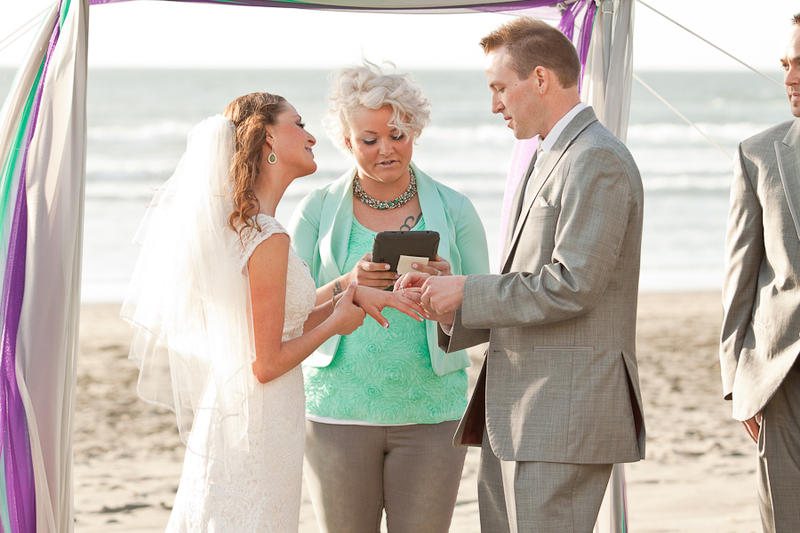 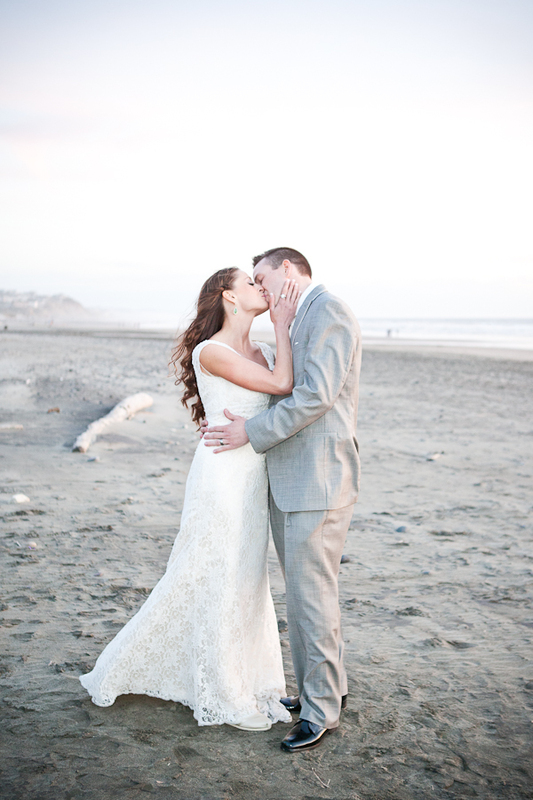 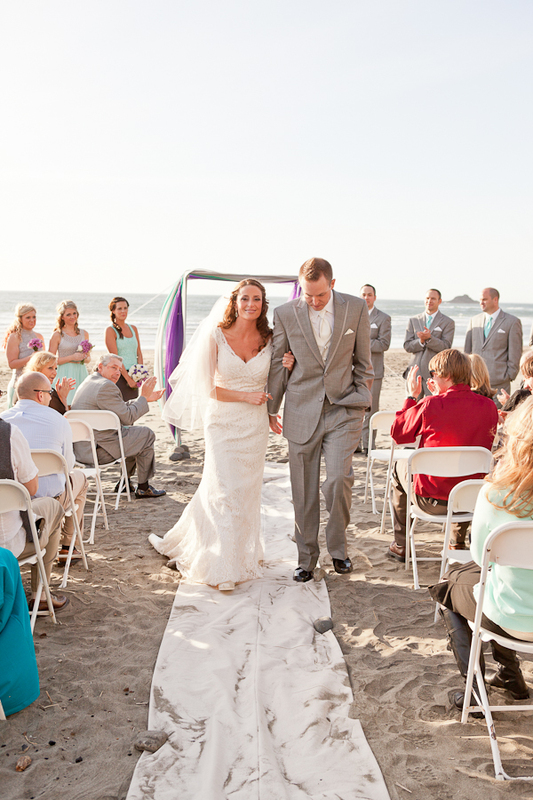 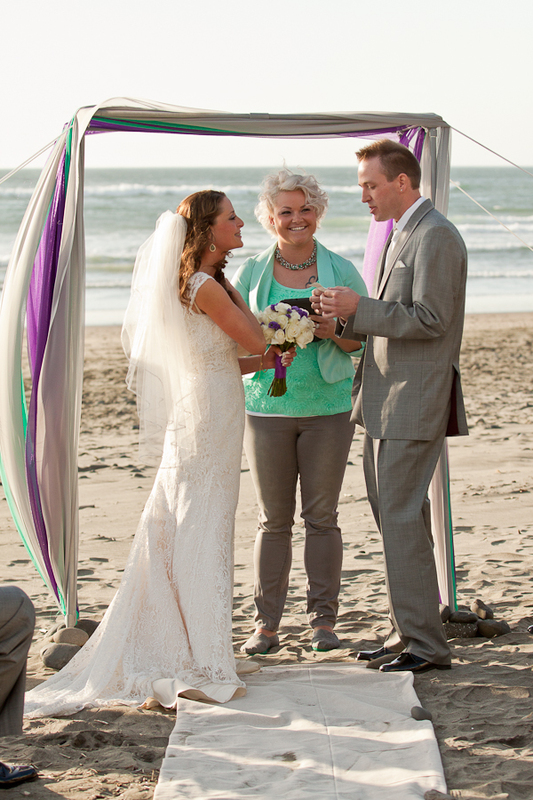 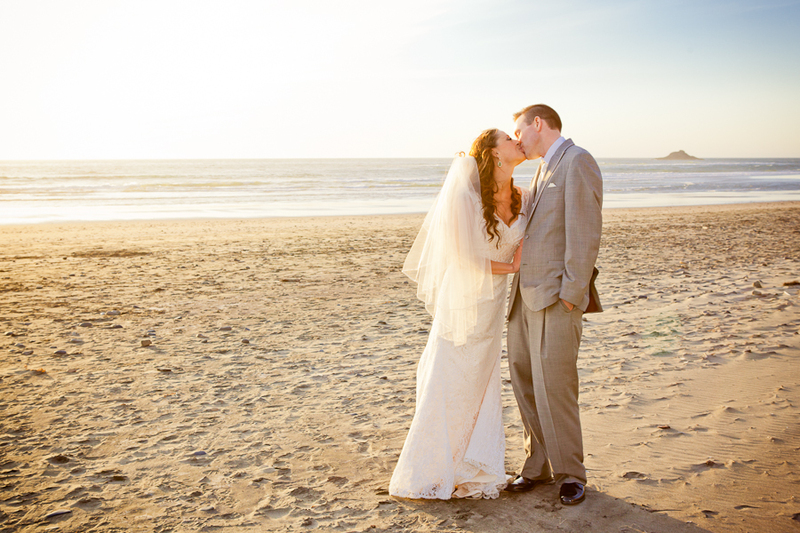 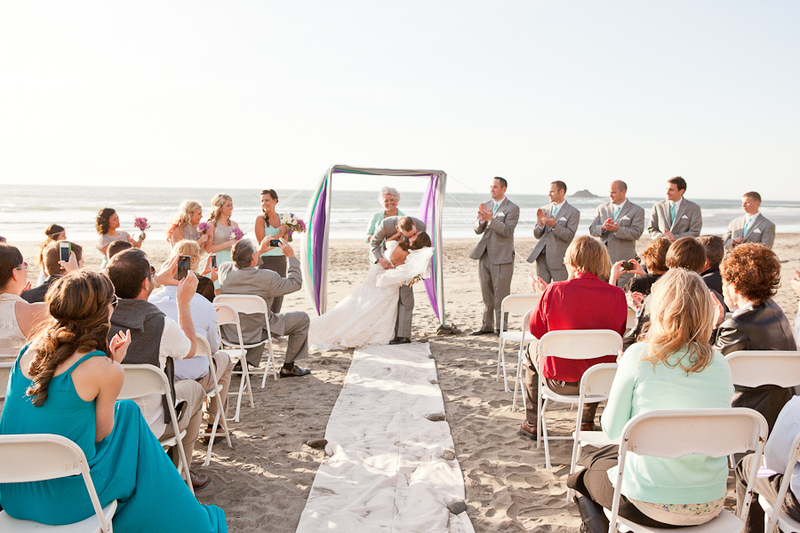 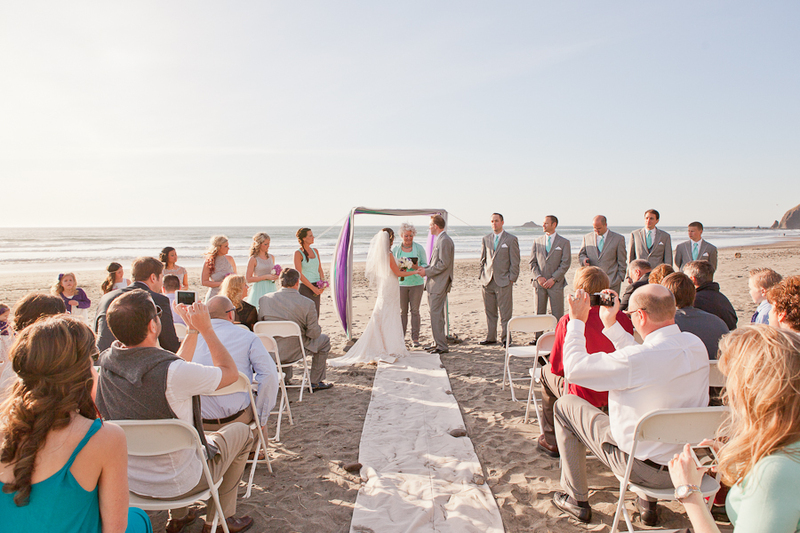 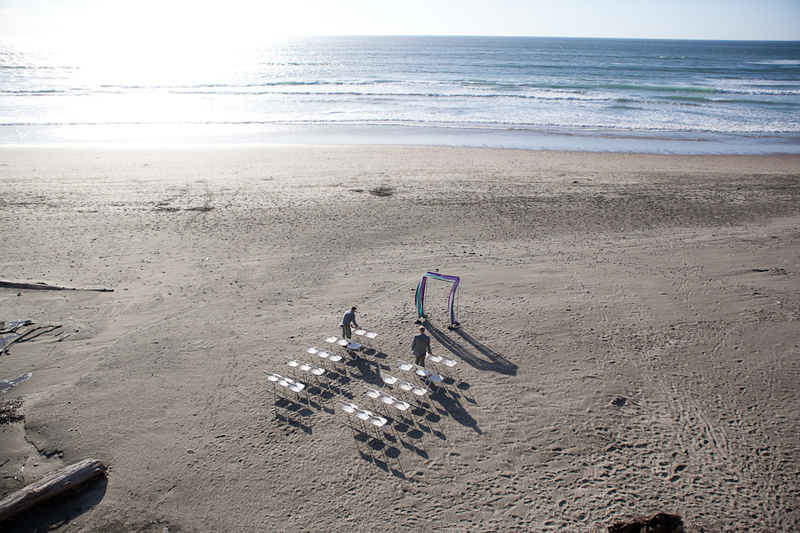 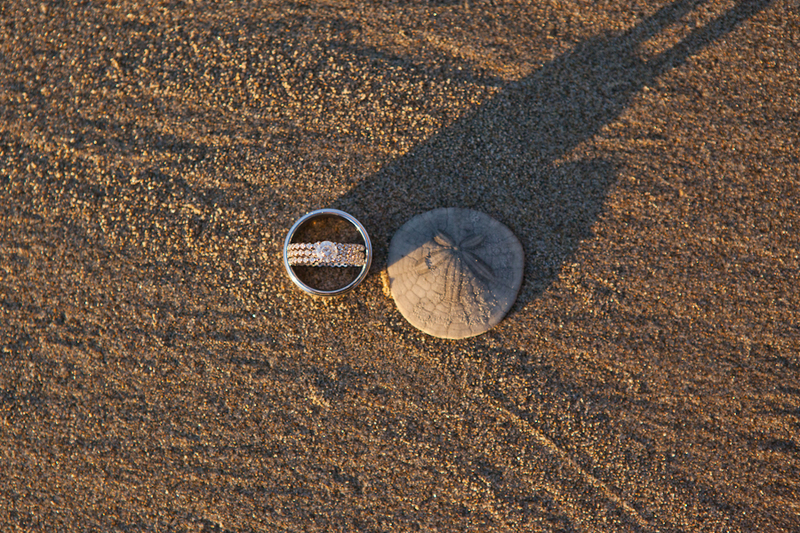 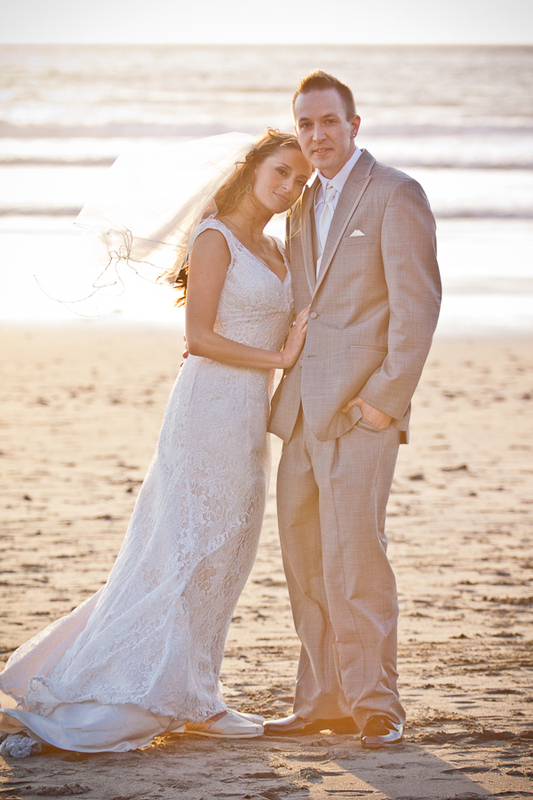 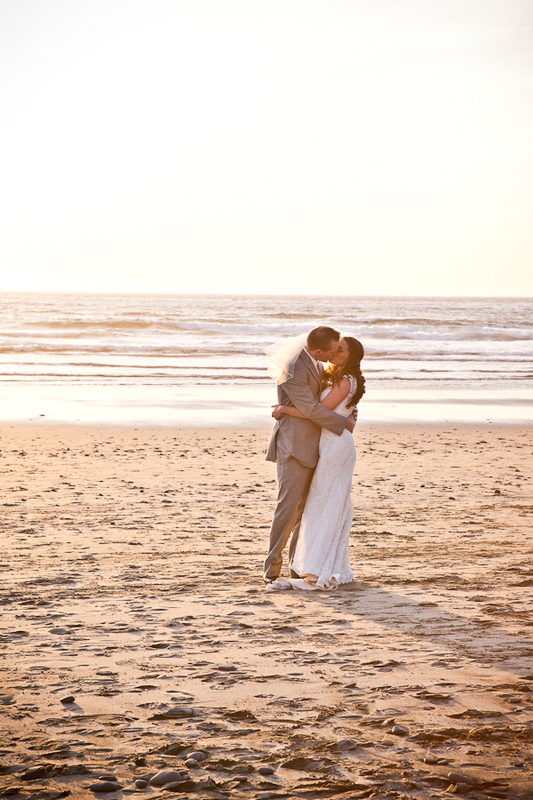 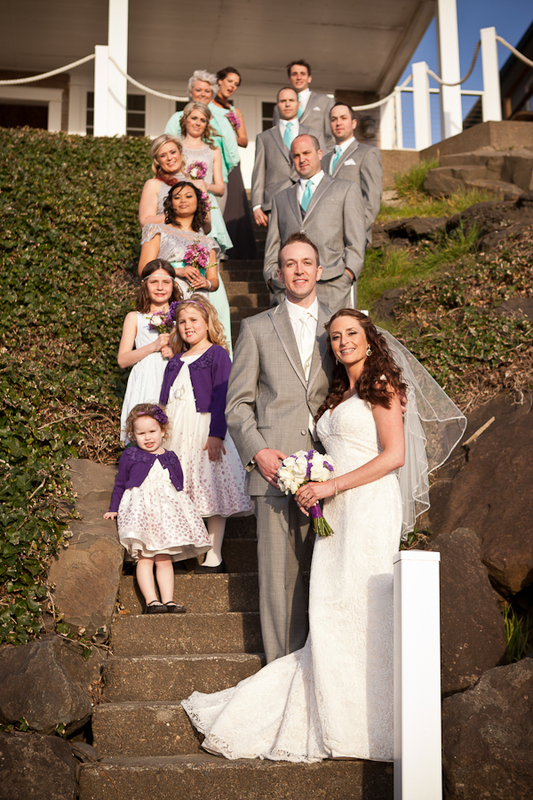 The ceremony took place with the Pacific Ocean as the backdrop, and ended just as the sun was beginning to set. 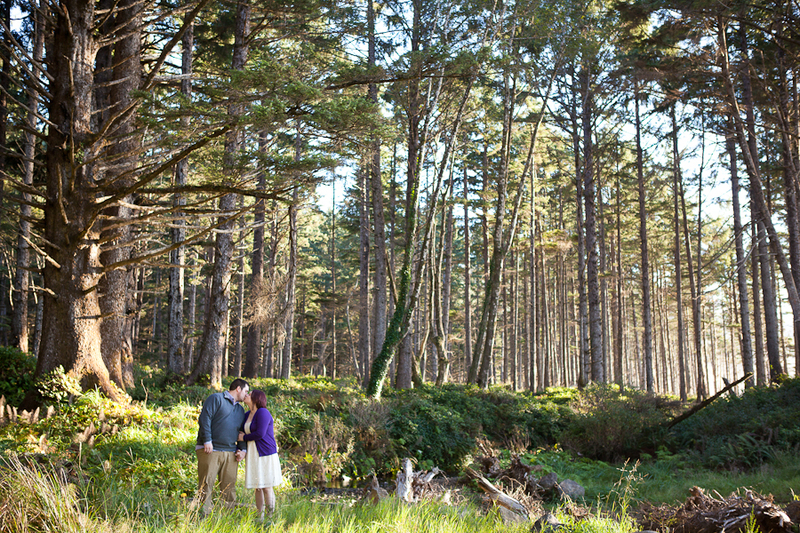 We were able to step away during cocktail hour and steal a few more photos as the sun slipped away. 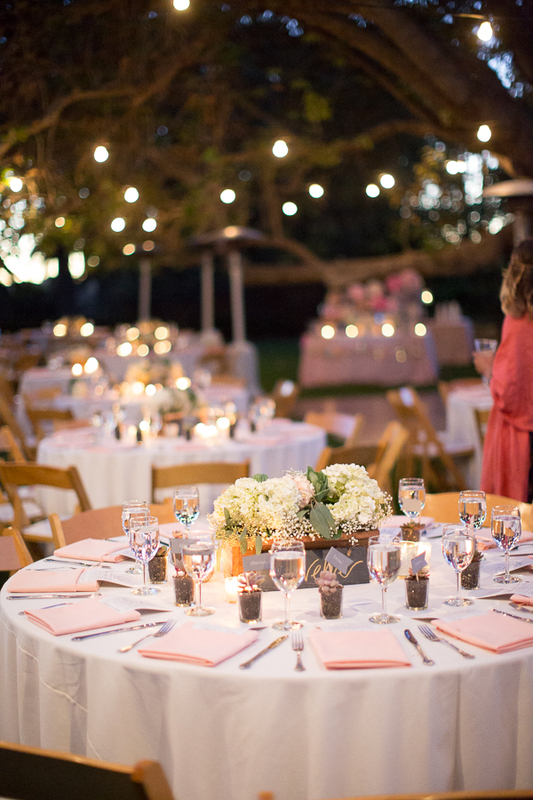 Guests then were treated to an amazing selection of pallela for dinner, along with some signature cocktails from the couple, and afterward everyone helped themselves to the wonderful dessert table. 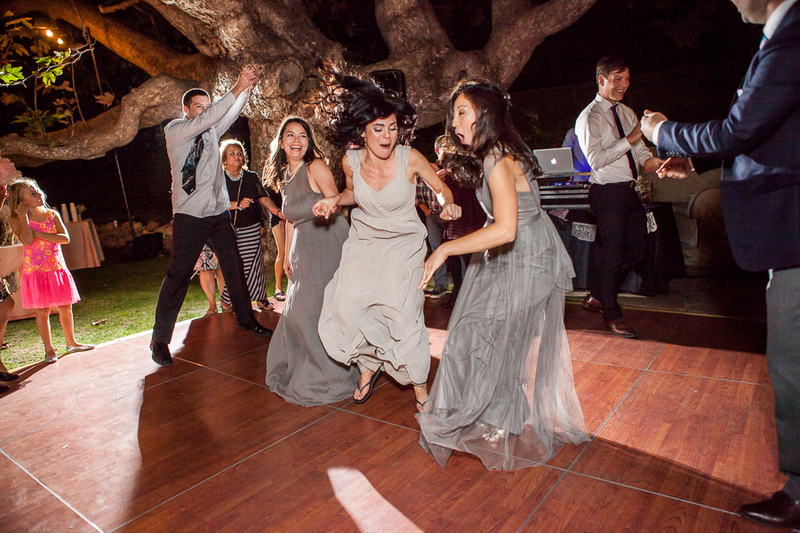 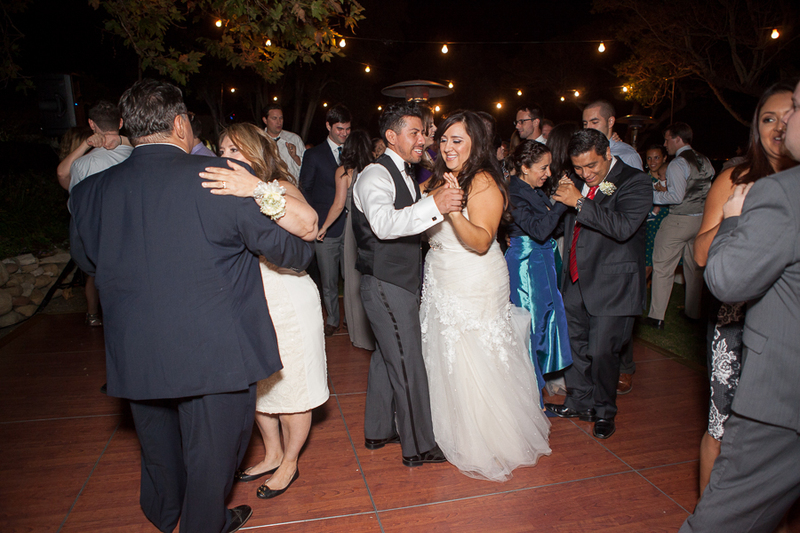 As evening turned to night, the guests made full use of the dance floor (seriously, there was so much dancing!). 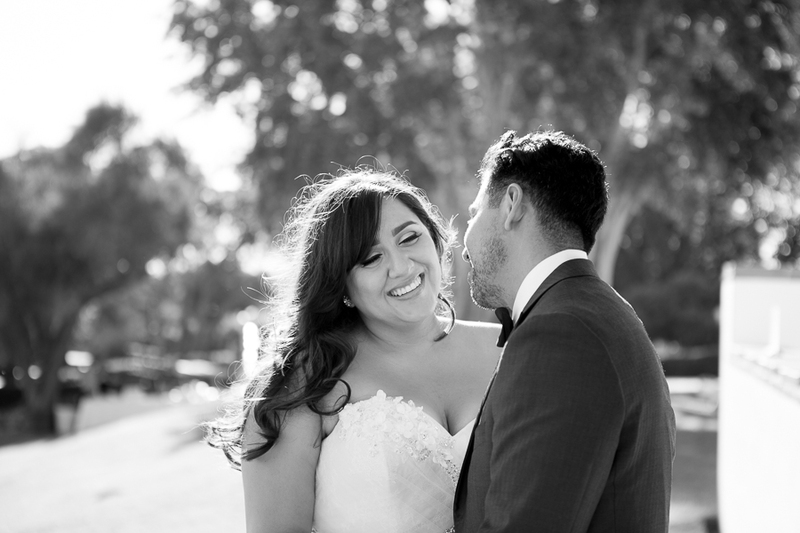 I am so very lucky that I got to capture some of this remarkable day for these two very special people, a few of my favorites are below. 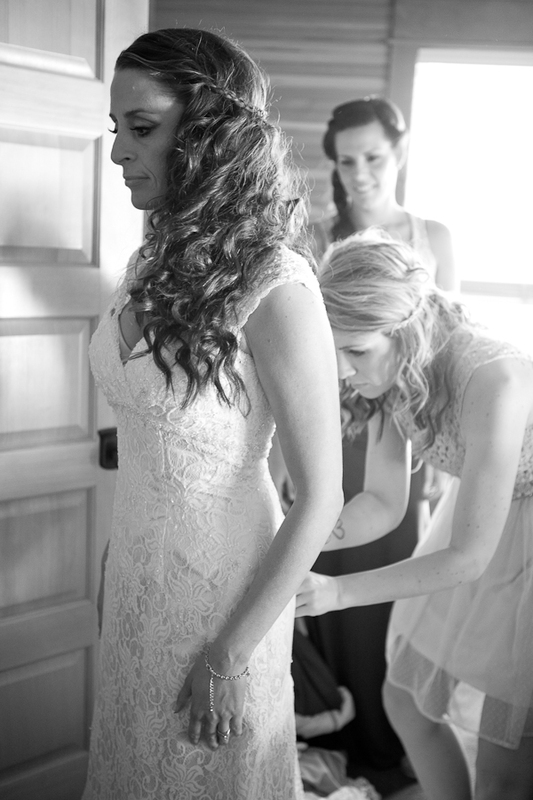 Brad and Rebecca’s wedding will always have a special place in my heart because it is the first wedding in which I was both the photographer and one of the witnesses. 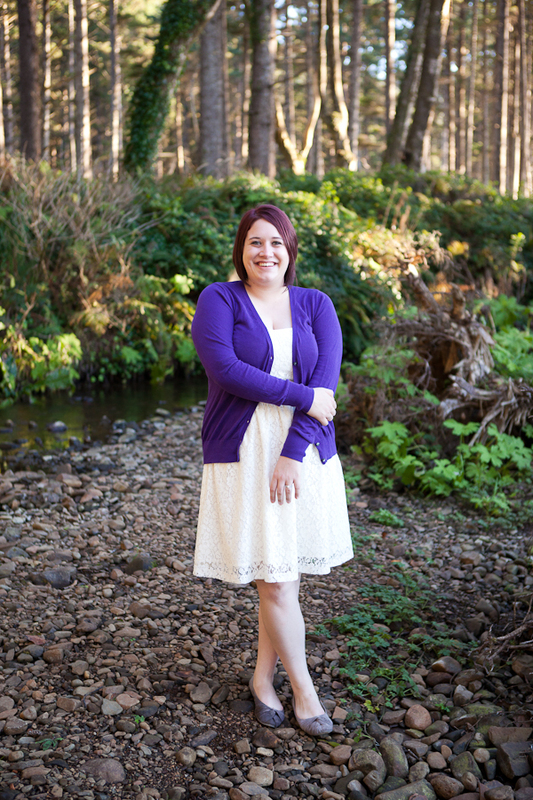 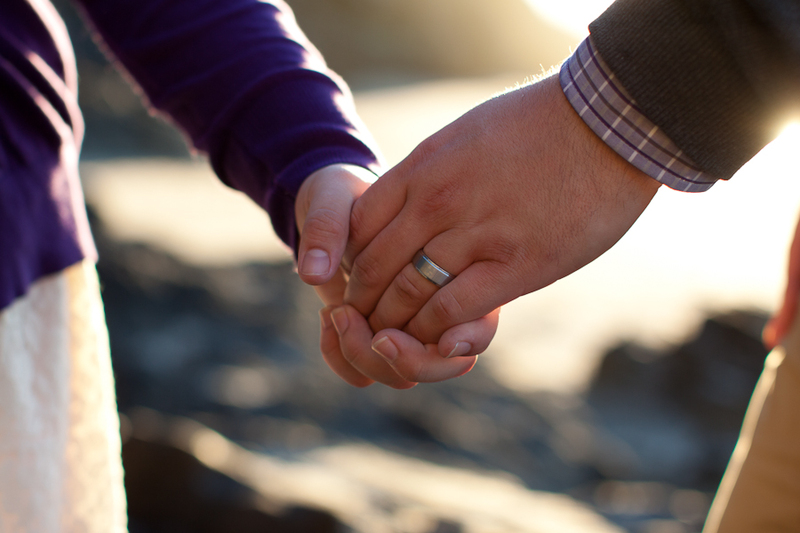 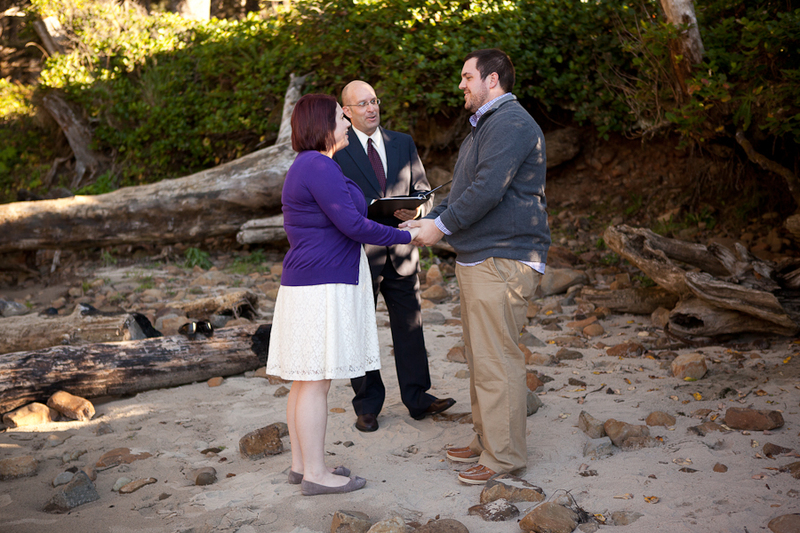 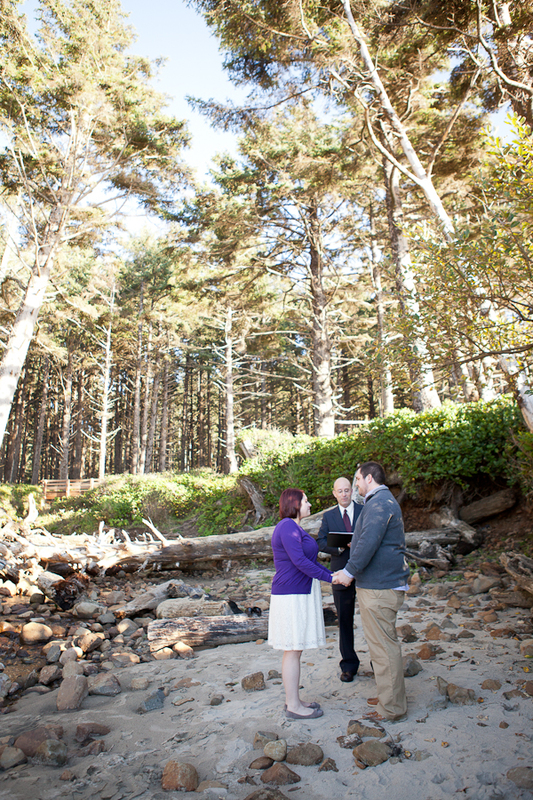 Their incredibly intimate ceremony happened at Cape Lookout State Park Beach in Tillamook, Oregon, and the only people present were the couple, myself, the officiant, and one other witness. 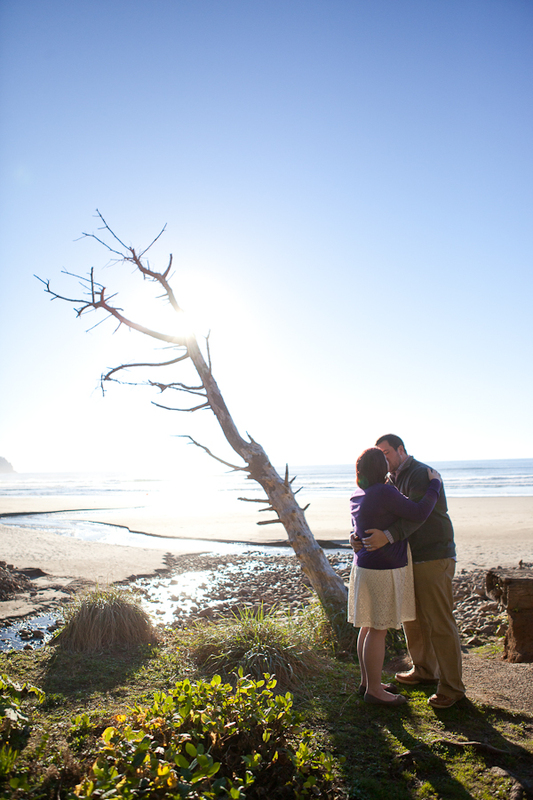 They got married on the banks of a small river that fed into the ocean, and after that the three of us spent about an hour wandering the beach taking pictures and watching as the sun began to set over the ocean. 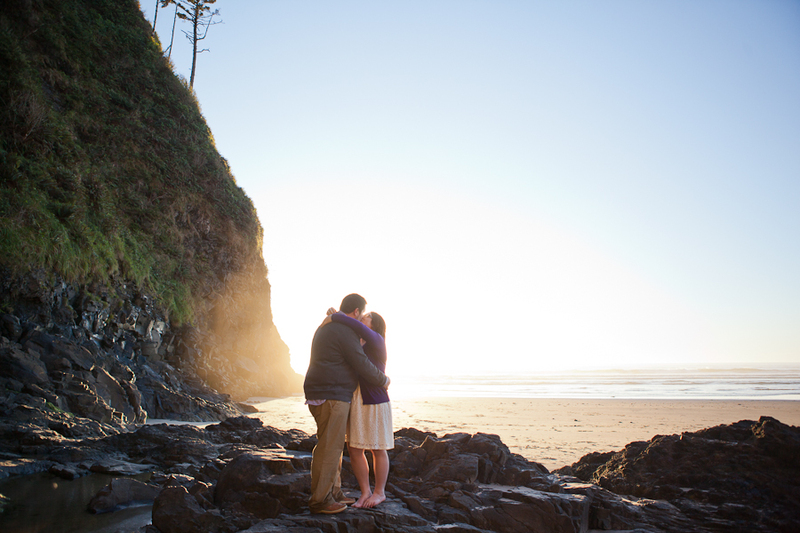 These two had traveled across the country to elope and spend some time exploring oregon – and they were really a joy to work with. 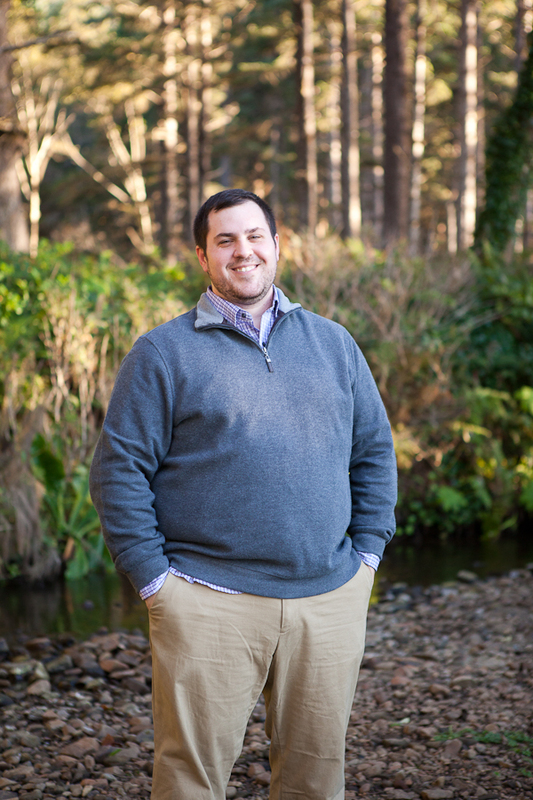 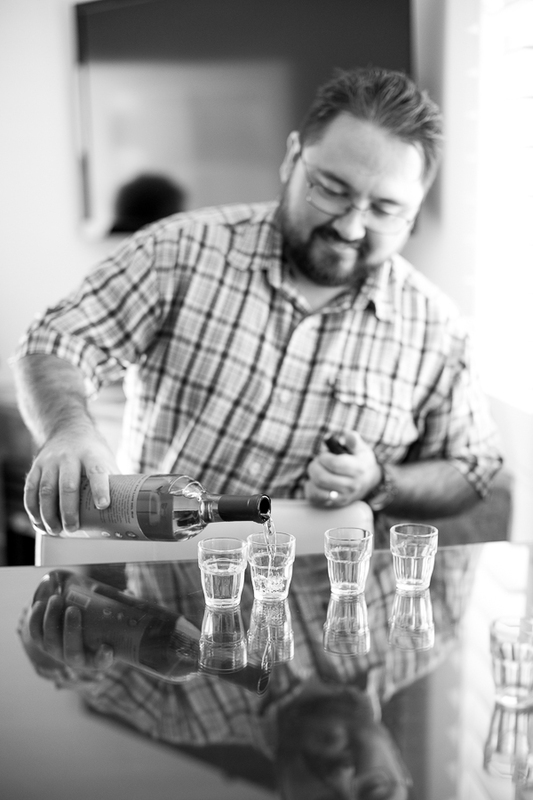 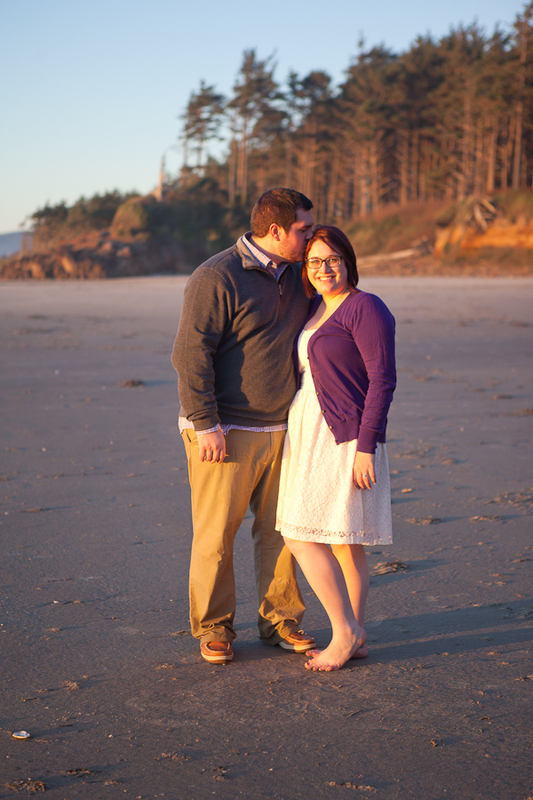 They were headed into Portland the next day, and so I gave them a few of my favorite spots to check out in the city, and was so happy to hear from Brad a few days later that they’d had a great time and even made it to one of my favorite restaurants. 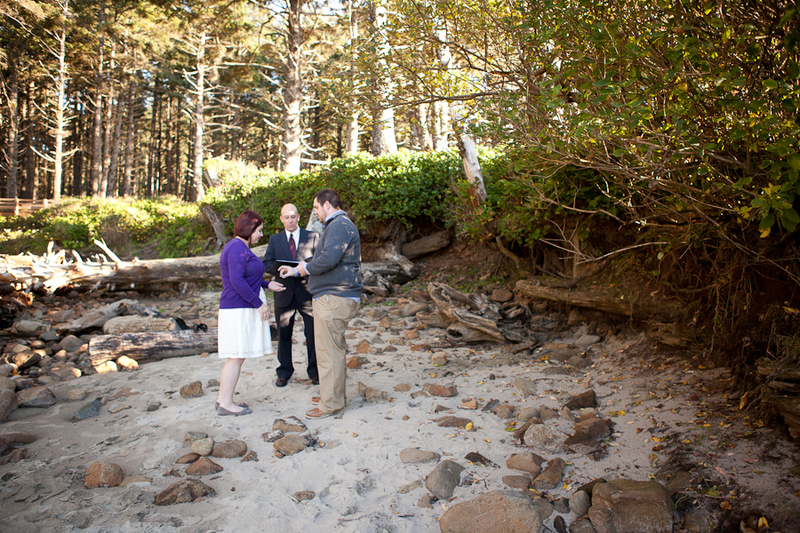 I hope to cross paths with them again in the future! 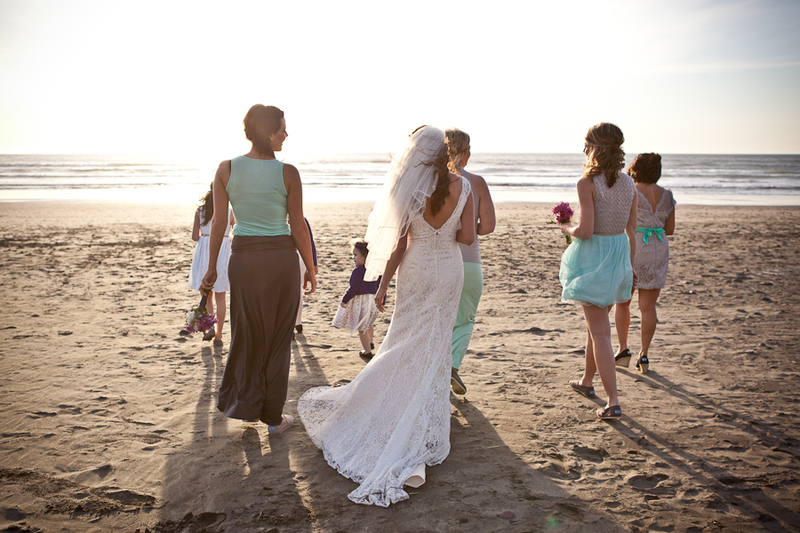 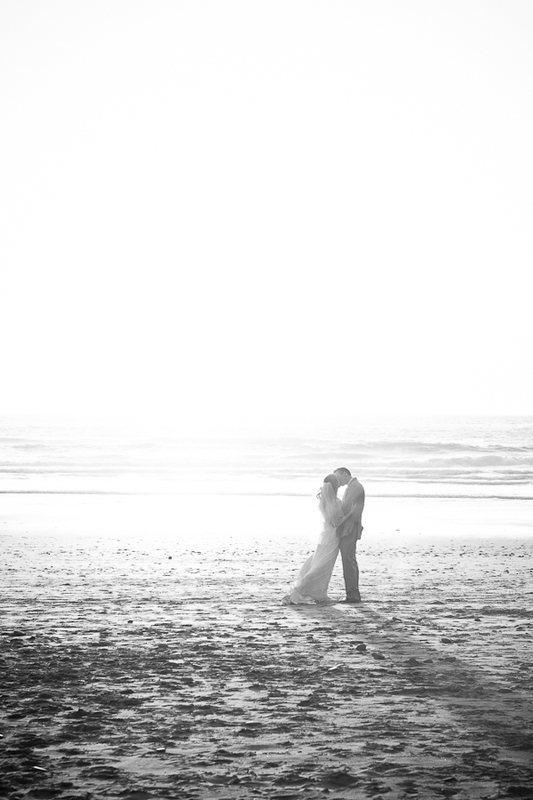 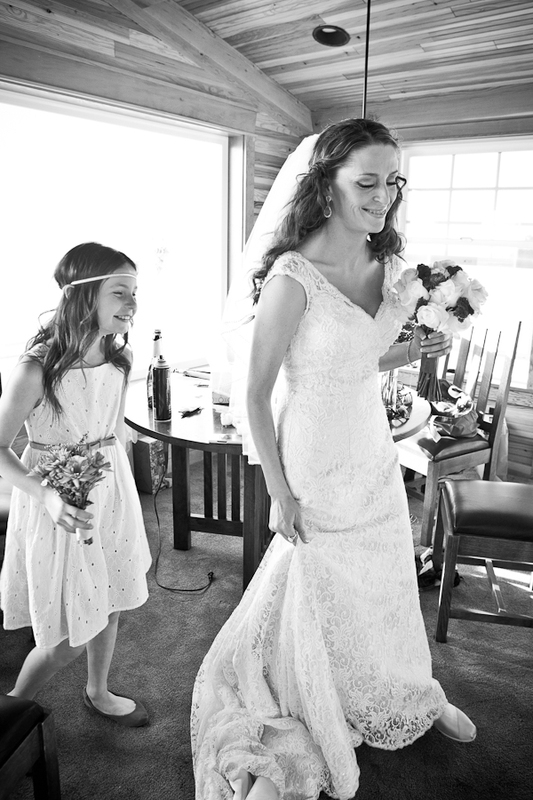 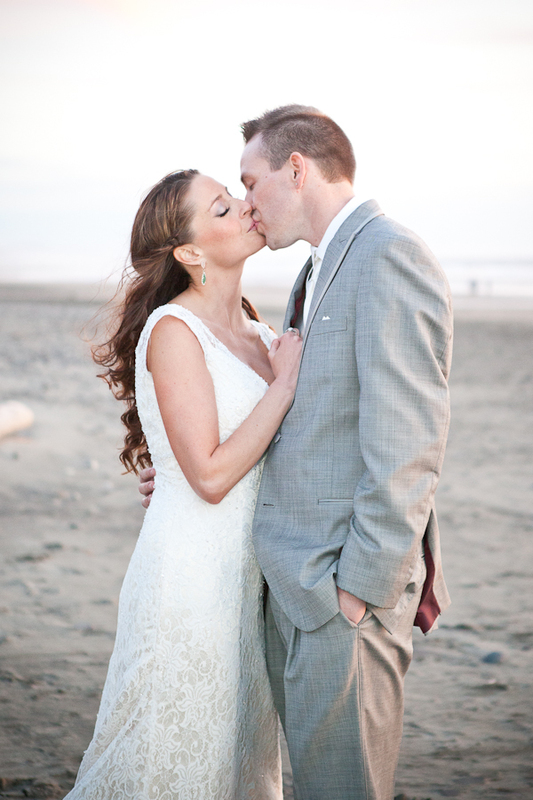 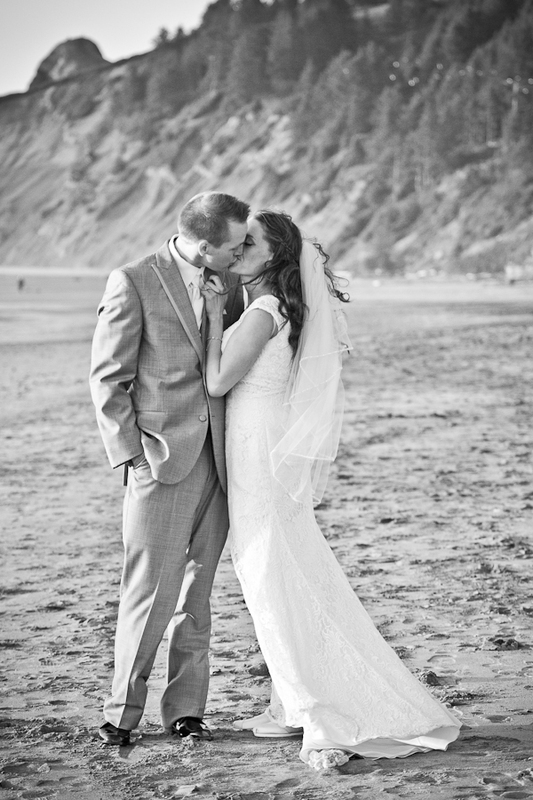 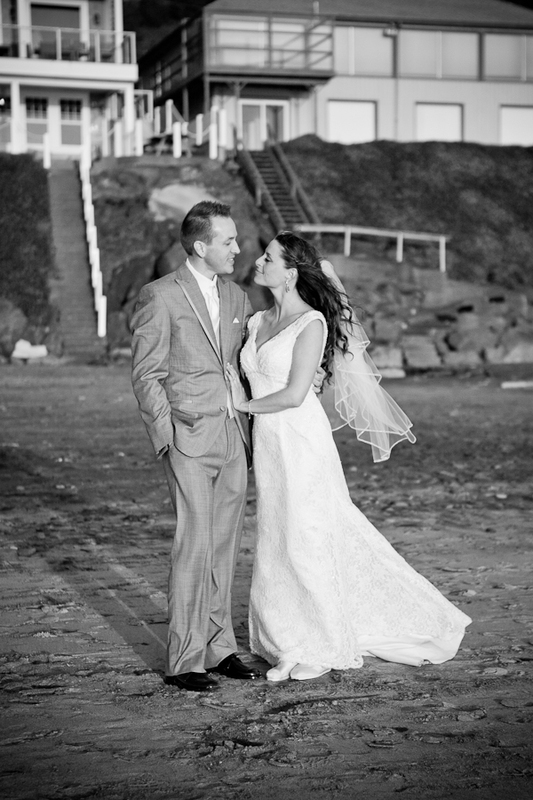 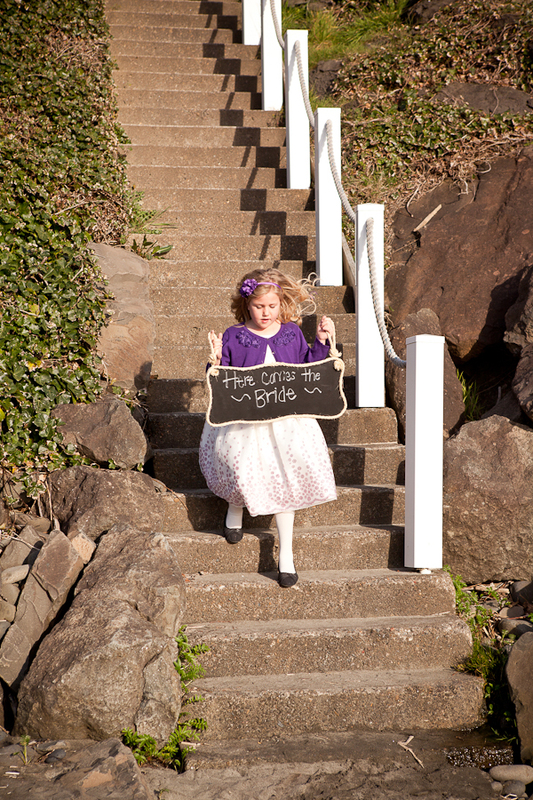 Wendy and Skylar were married this March on the beach in Lincoln City, and I’m just finally blogging it. 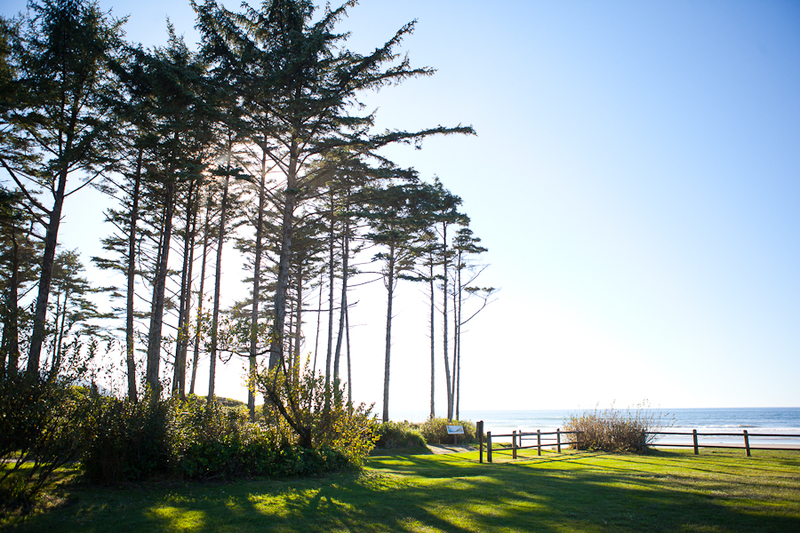 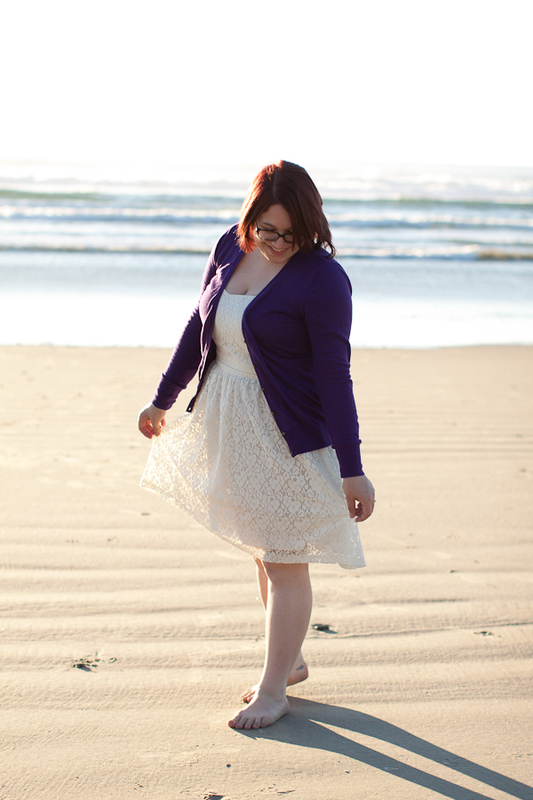 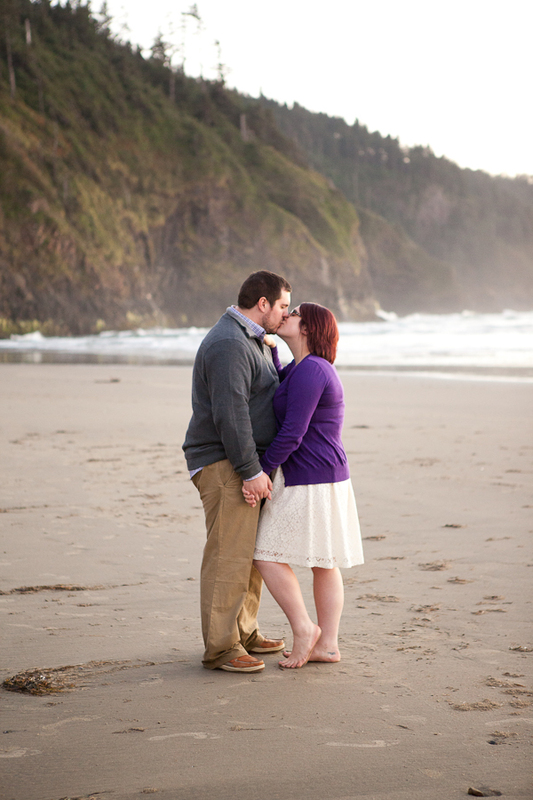 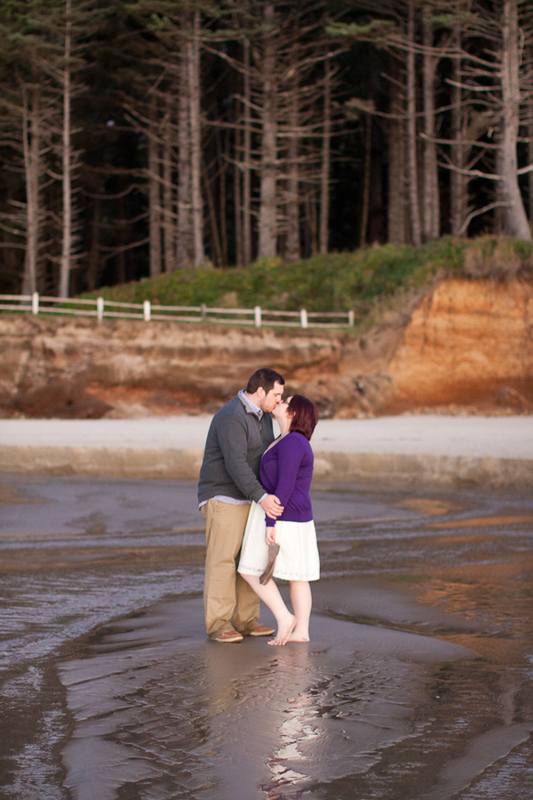 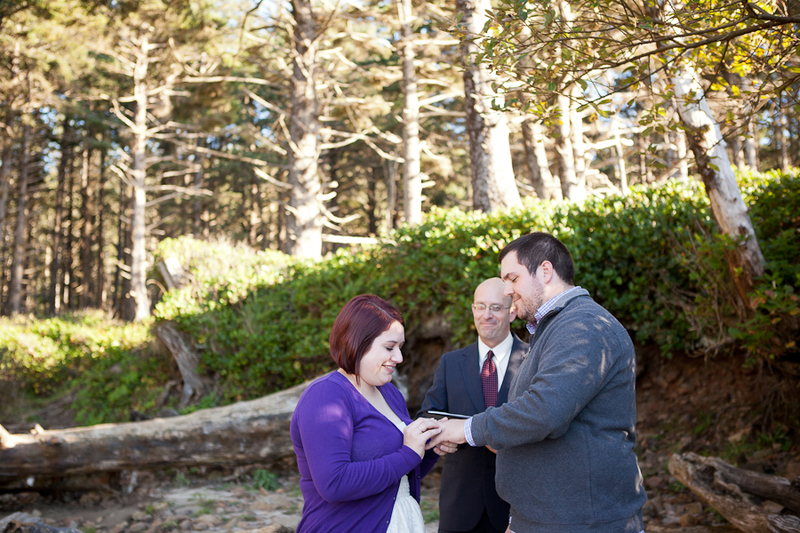 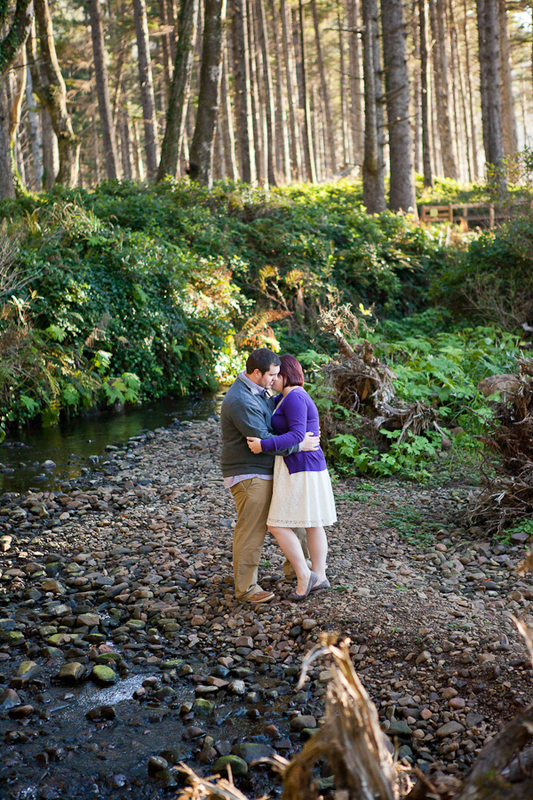 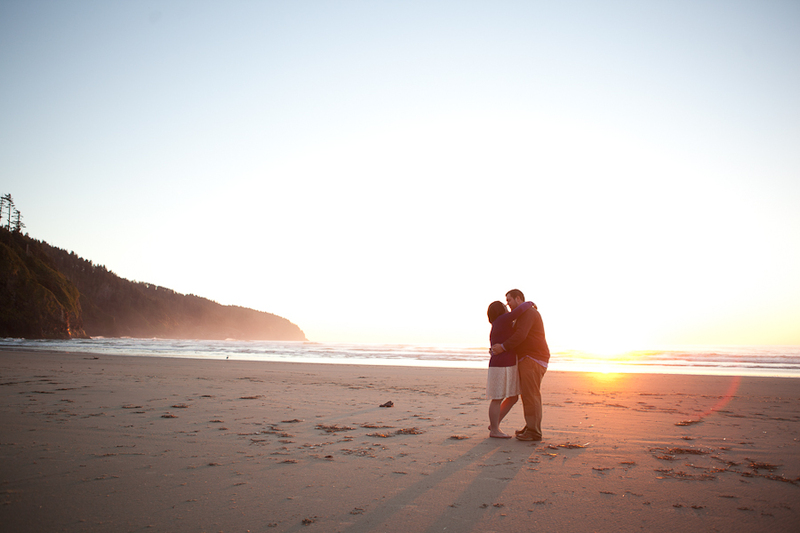 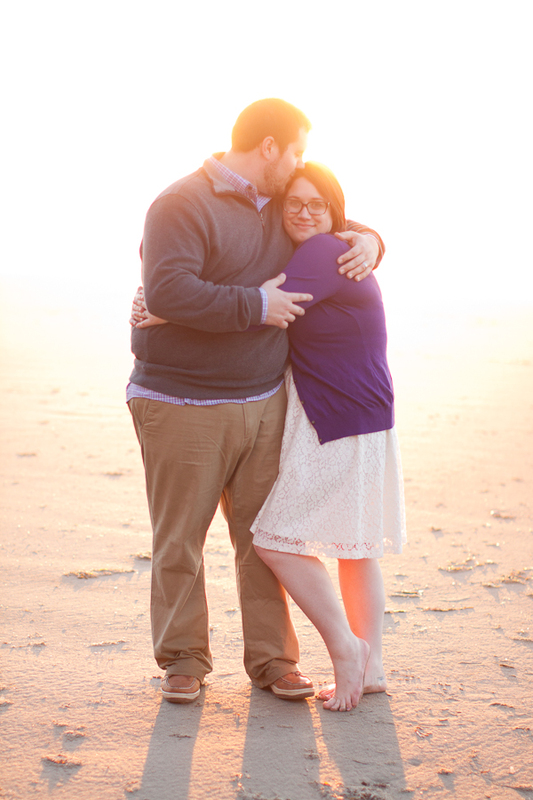 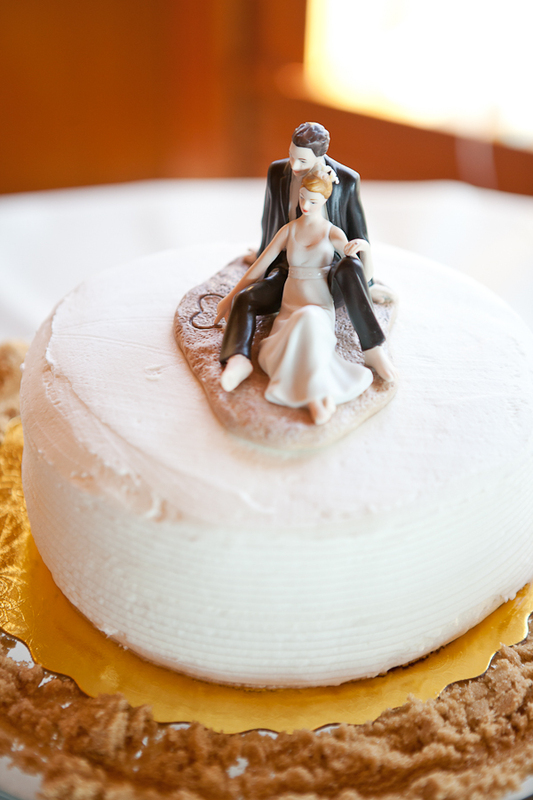 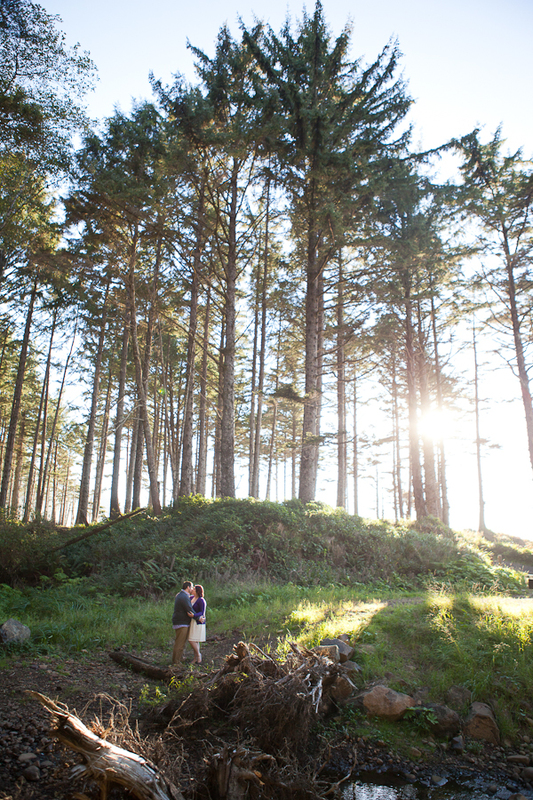 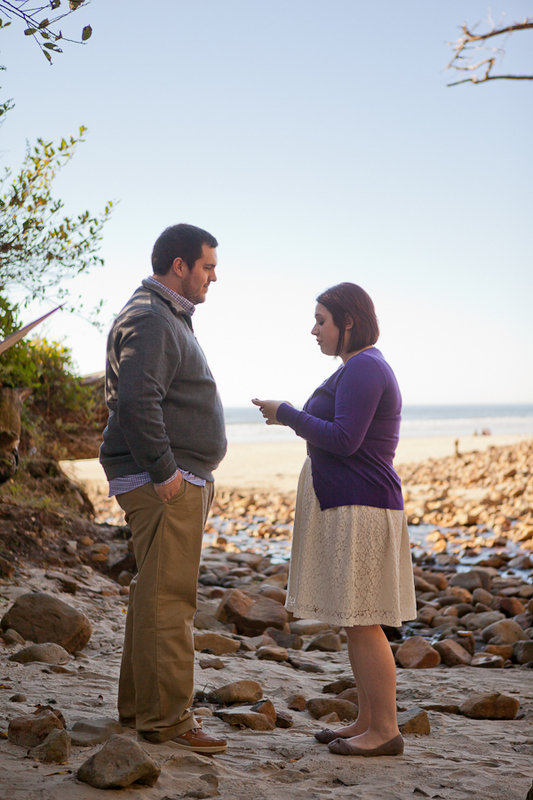 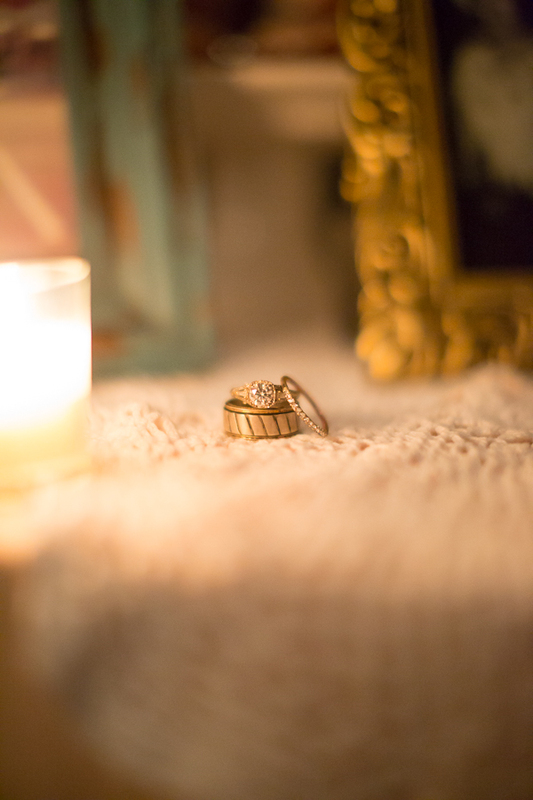 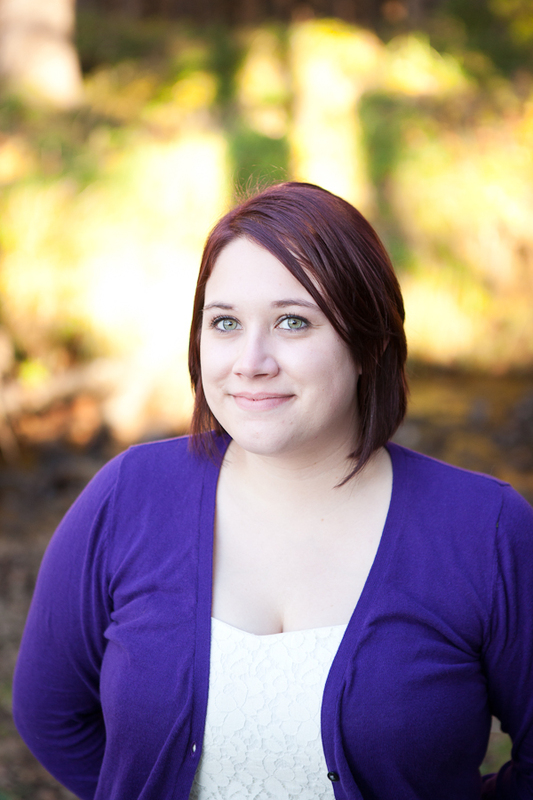 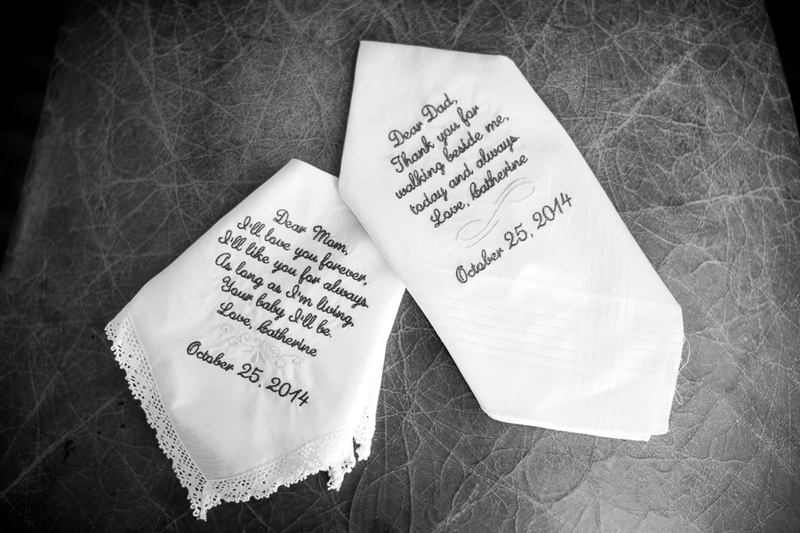 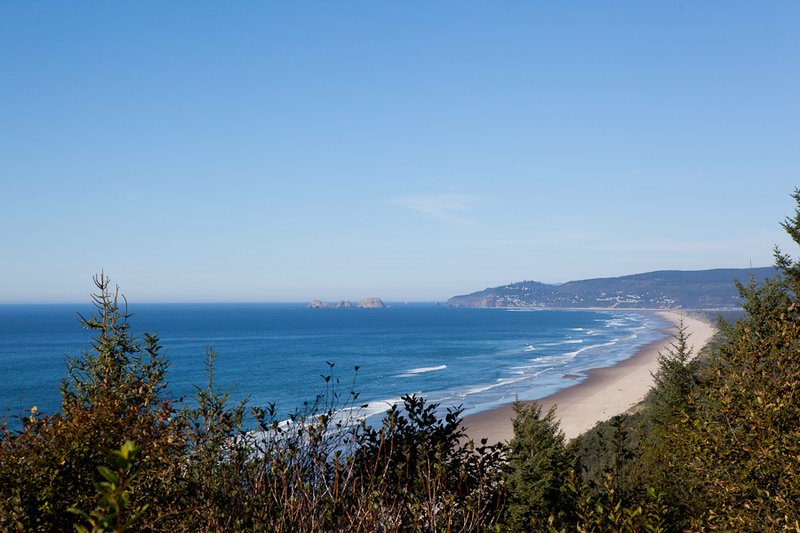 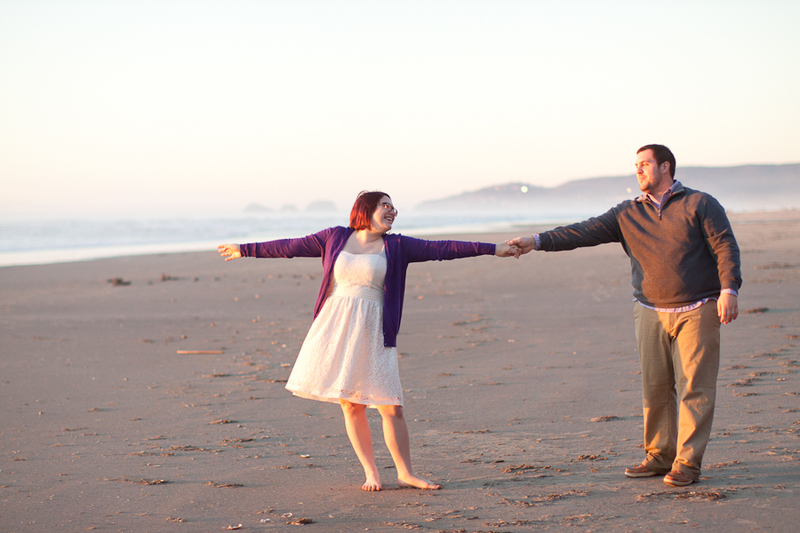 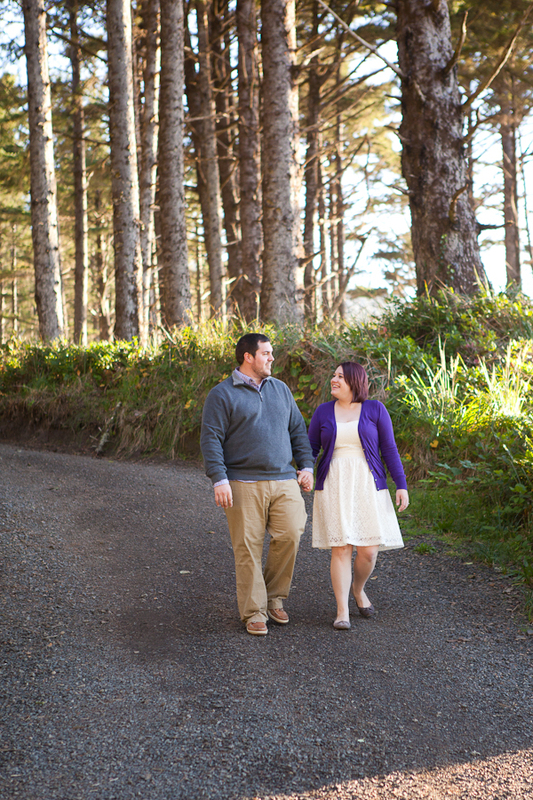 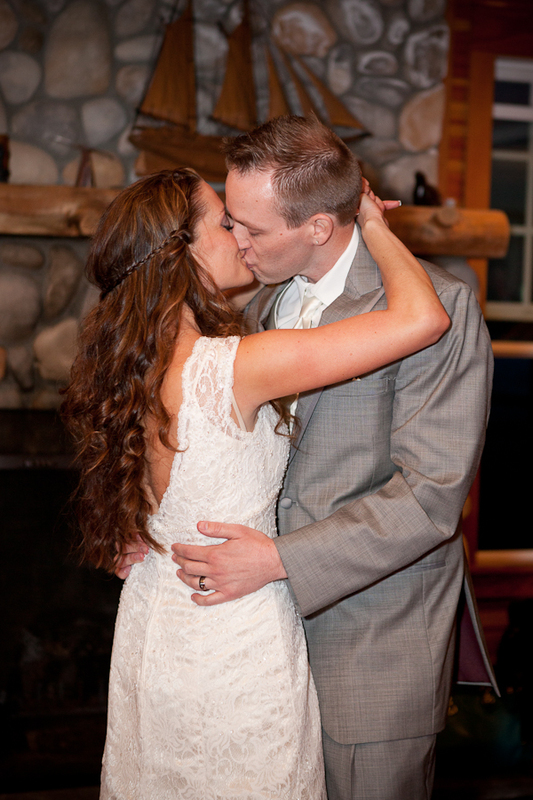 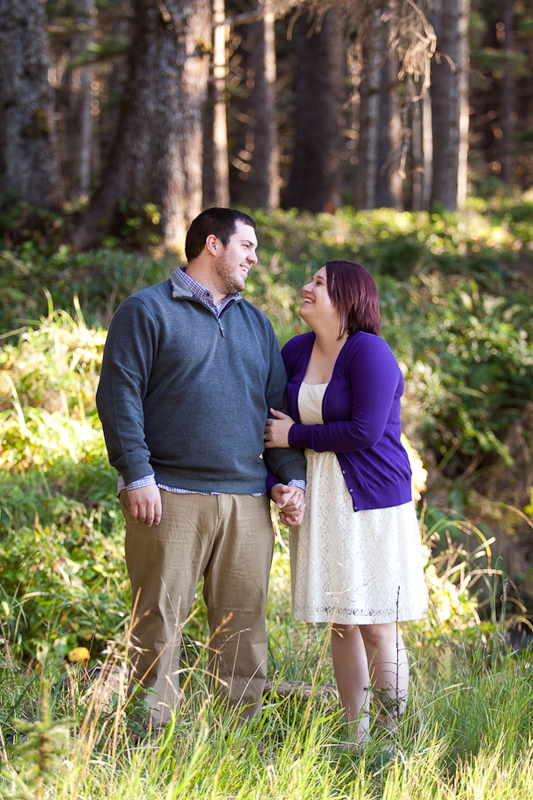 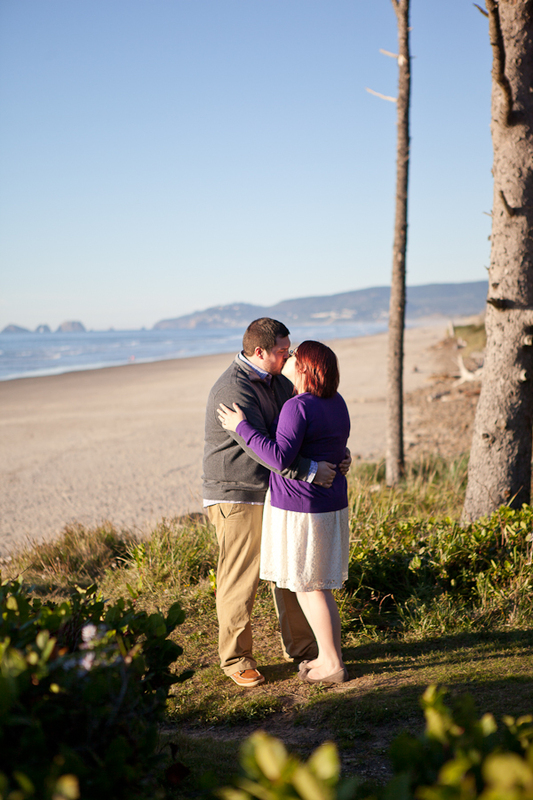 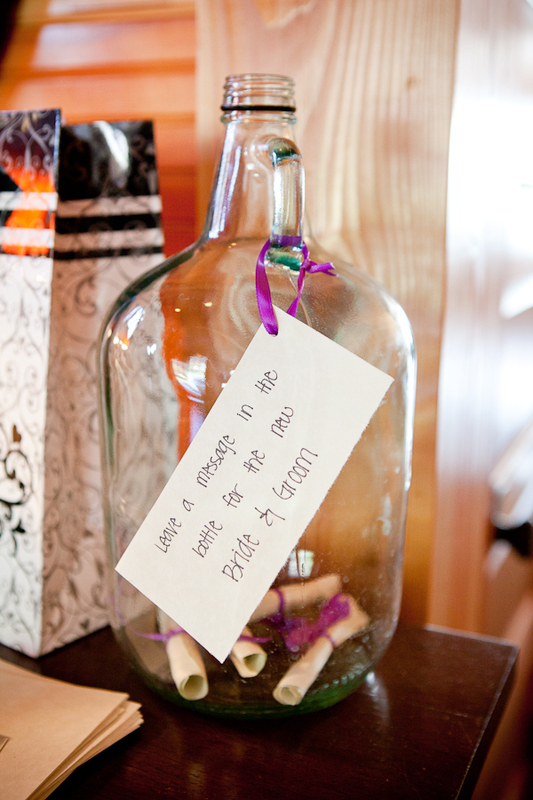 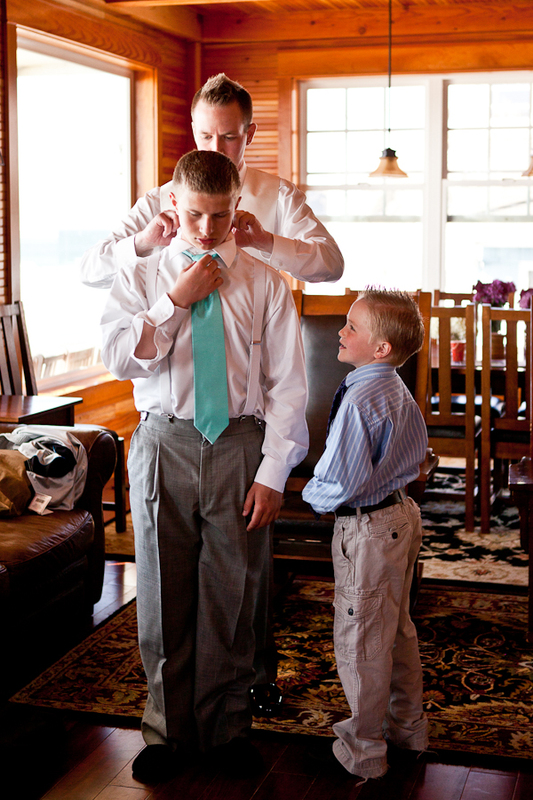 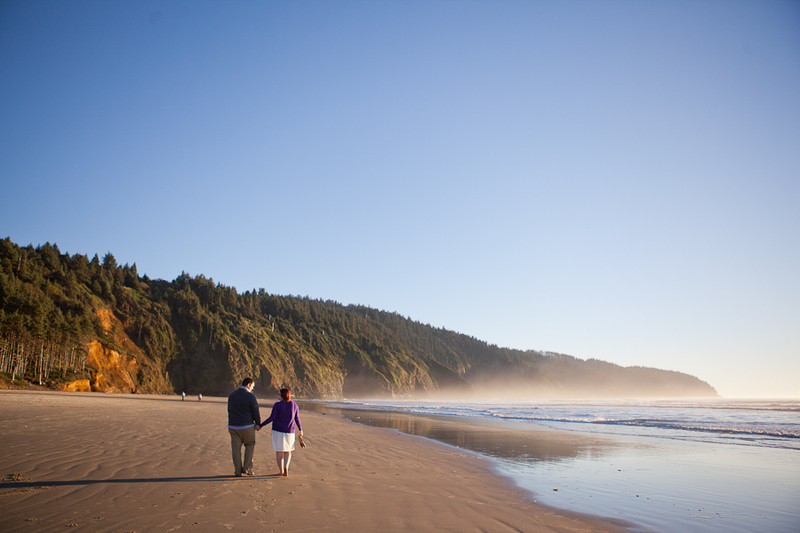 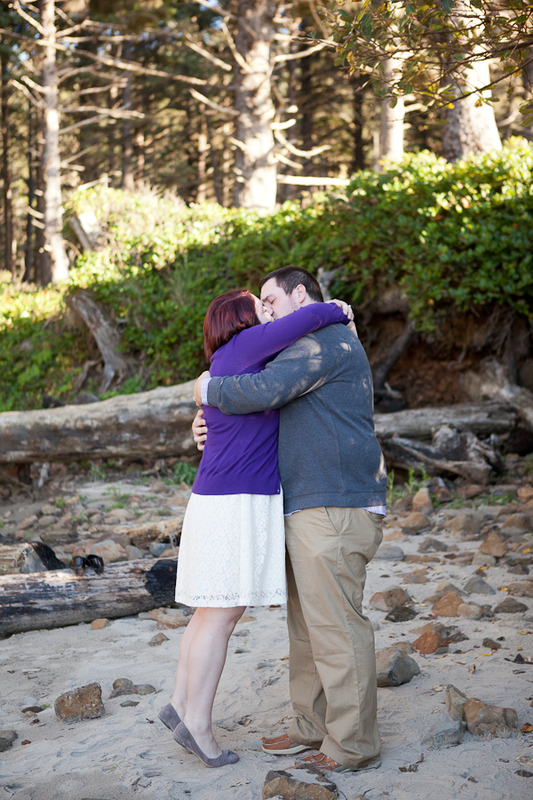 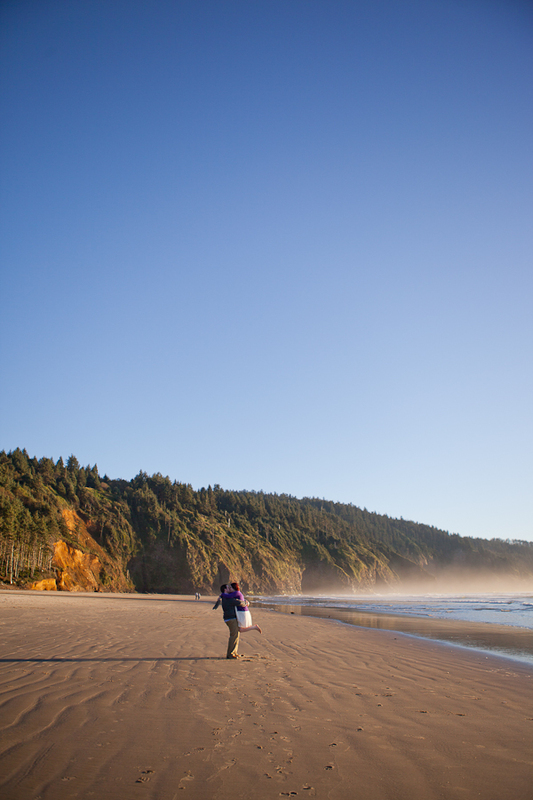 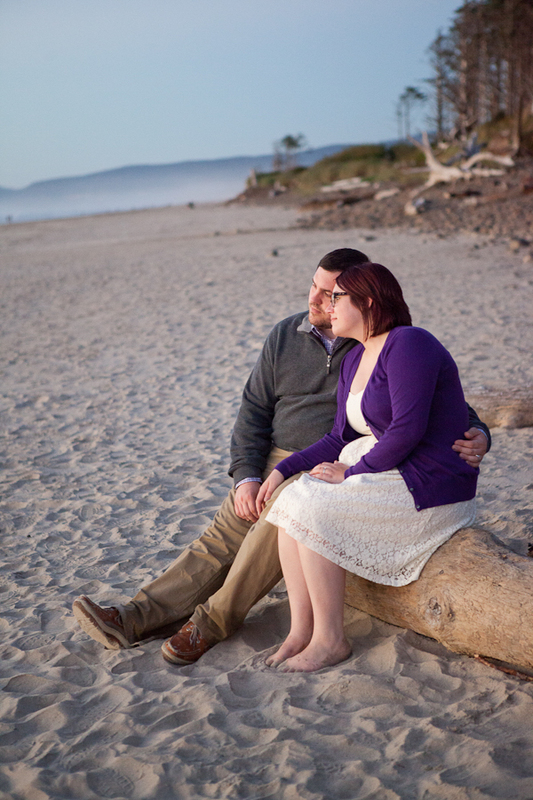 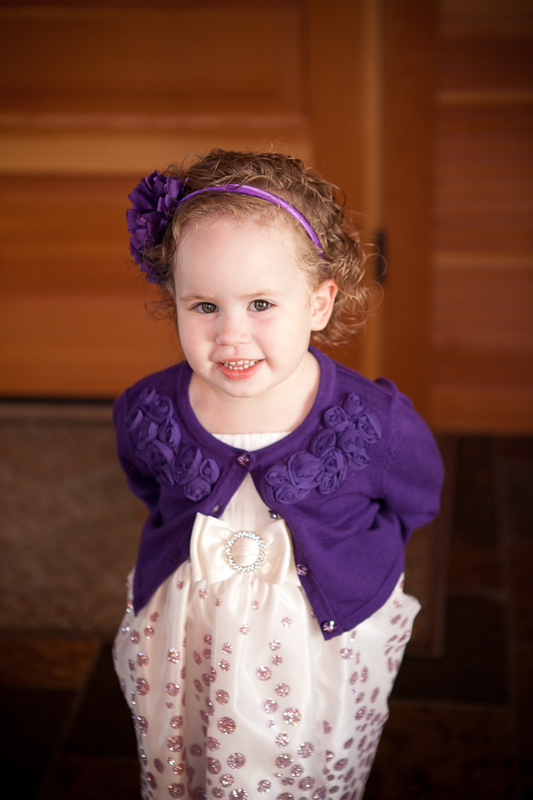 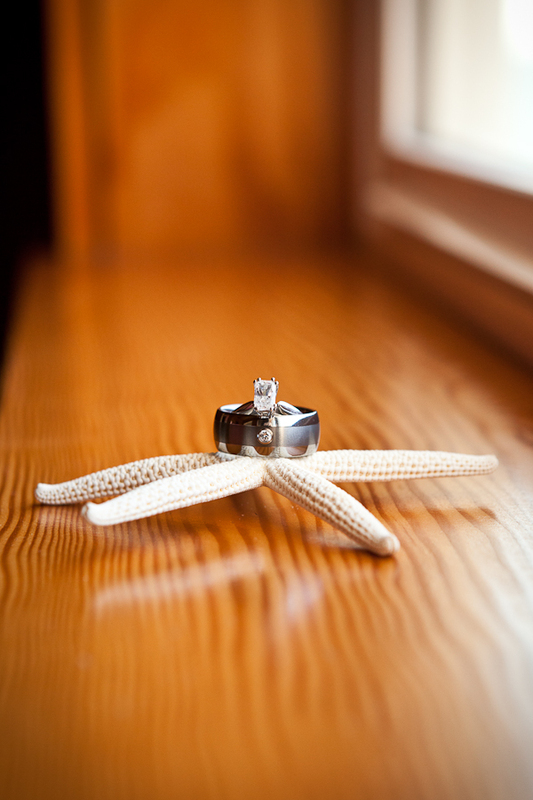 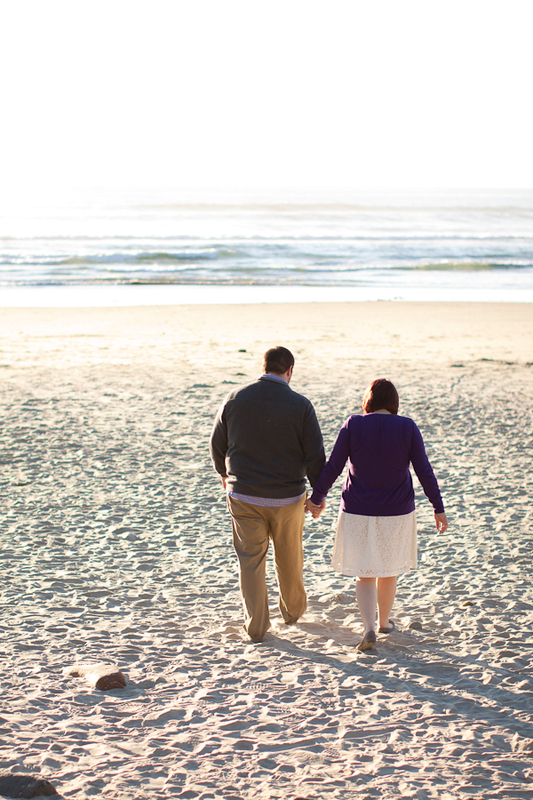 I have to admit, when they first told me they were planning a sunset beach wedding that early in the year (in Oregon!) 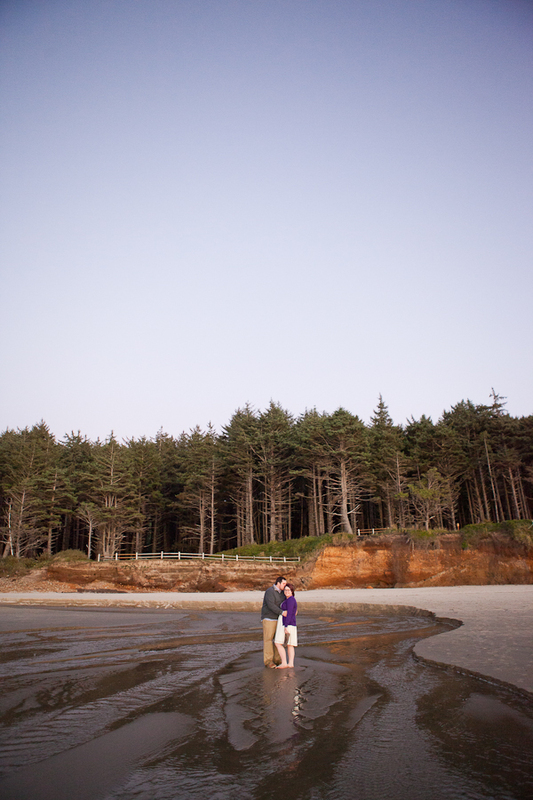 I figured we’d be dealing with rain, but when I arrived in Lincoln City that weekend, we were so lucky to experience unseasonably great weather, and, although it was a bit windy, the skies were sunny and clear on their wedding day. 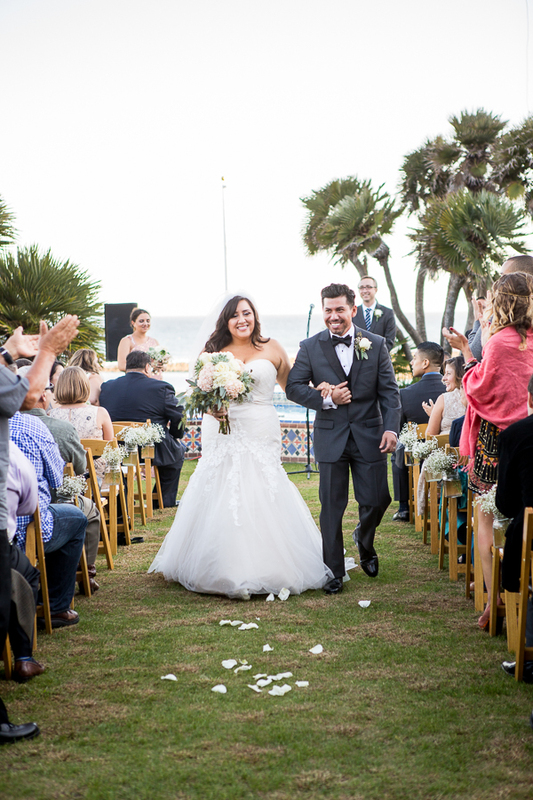 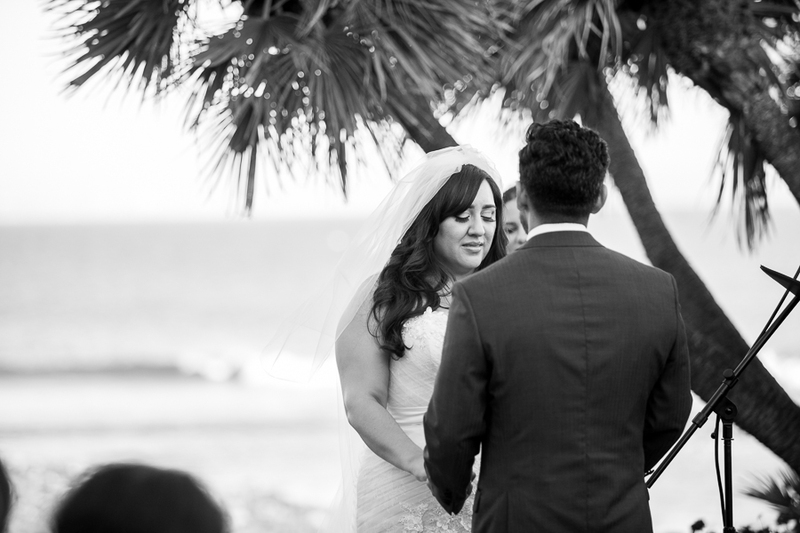 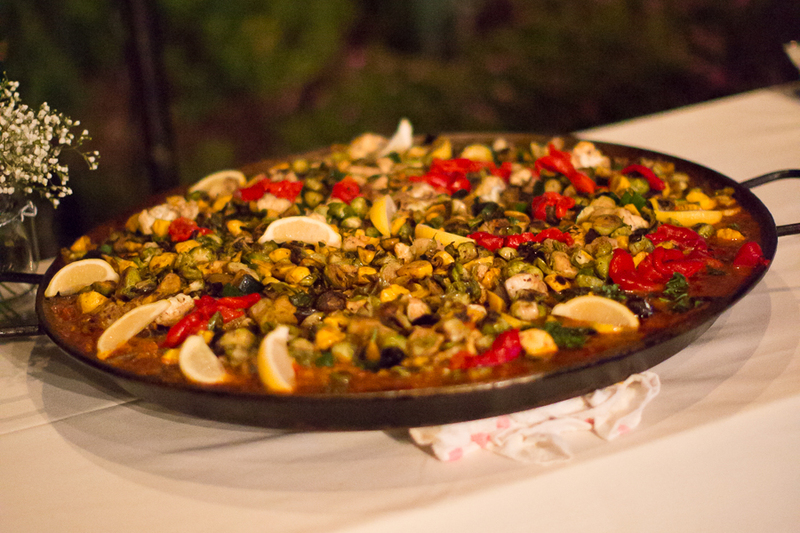 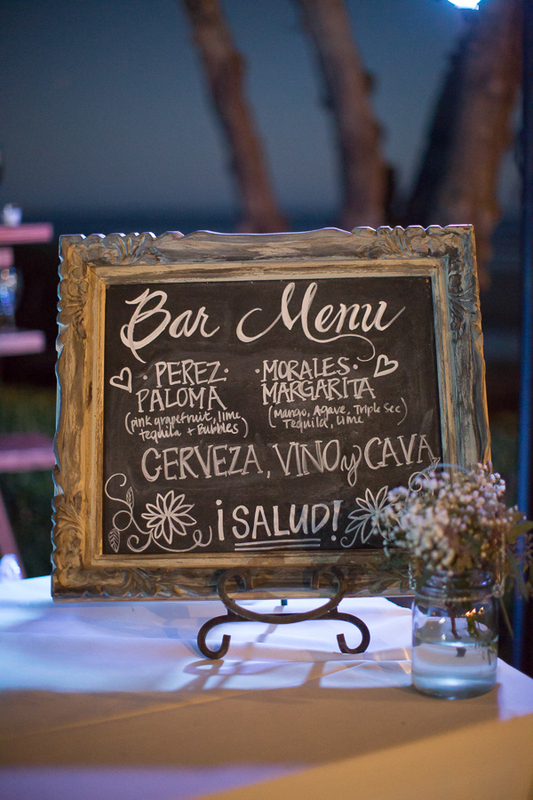 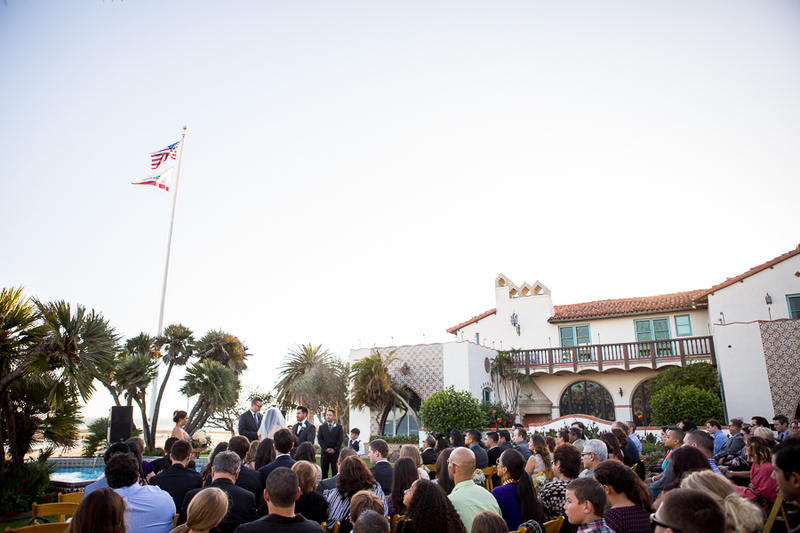 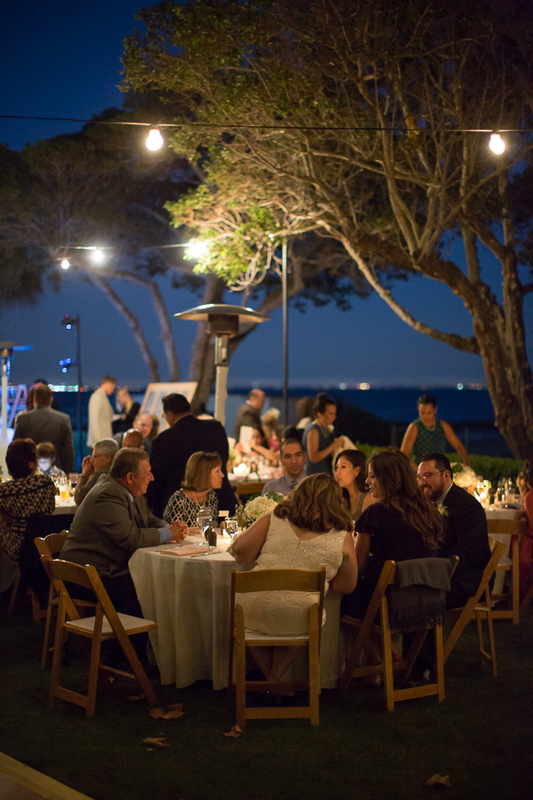 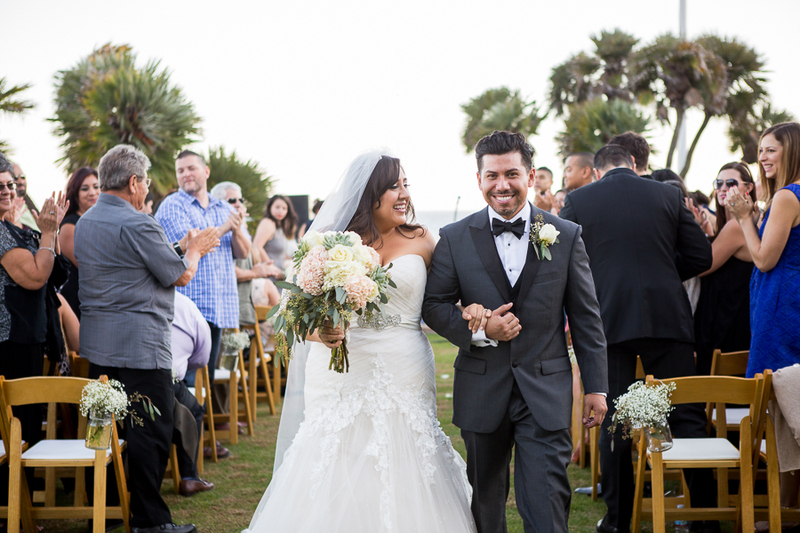 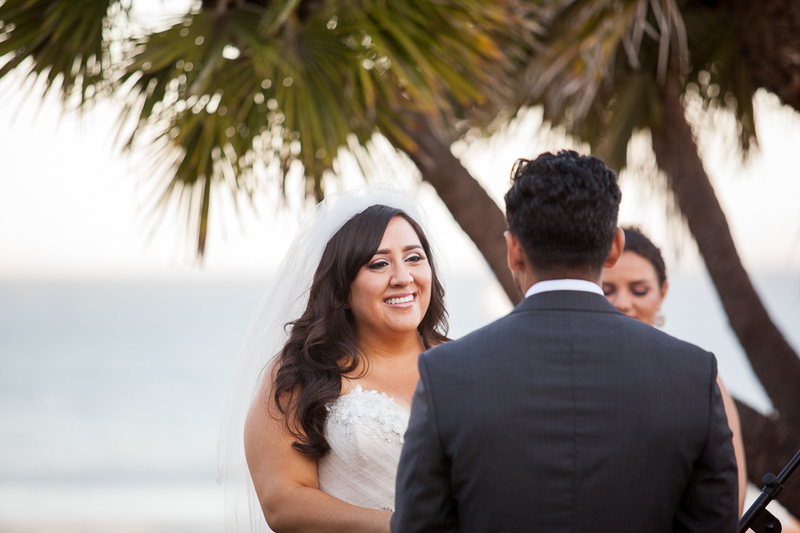 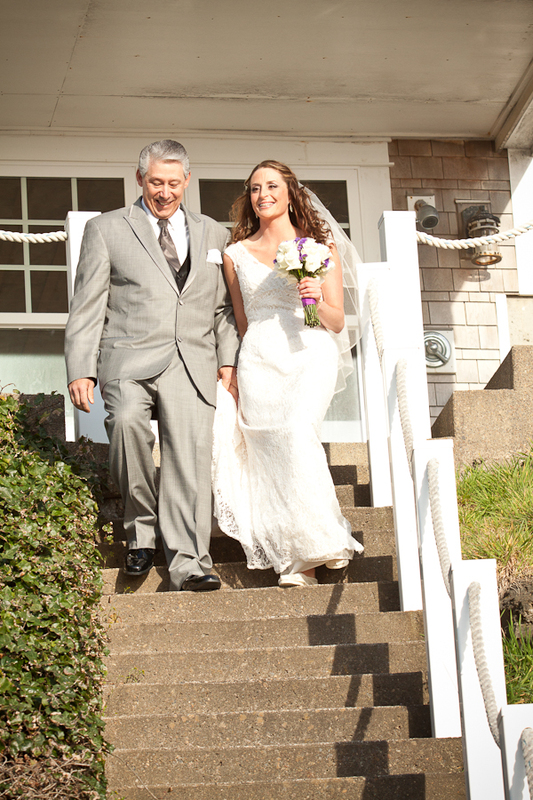 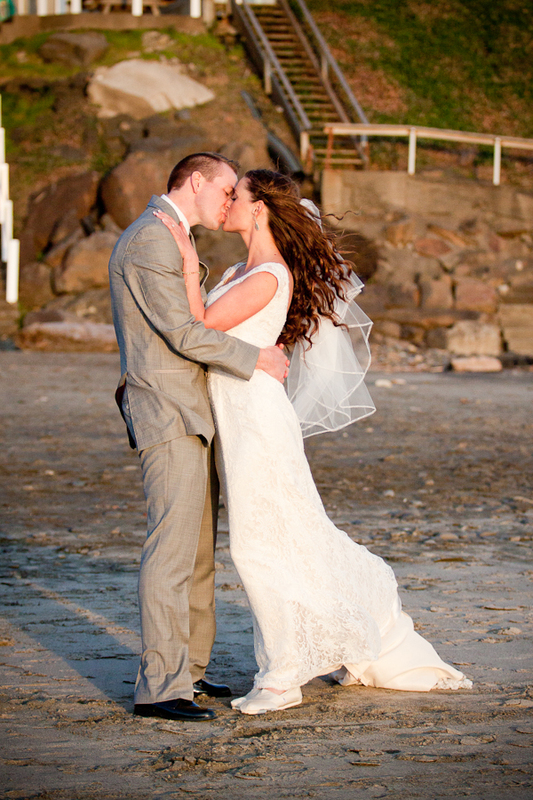 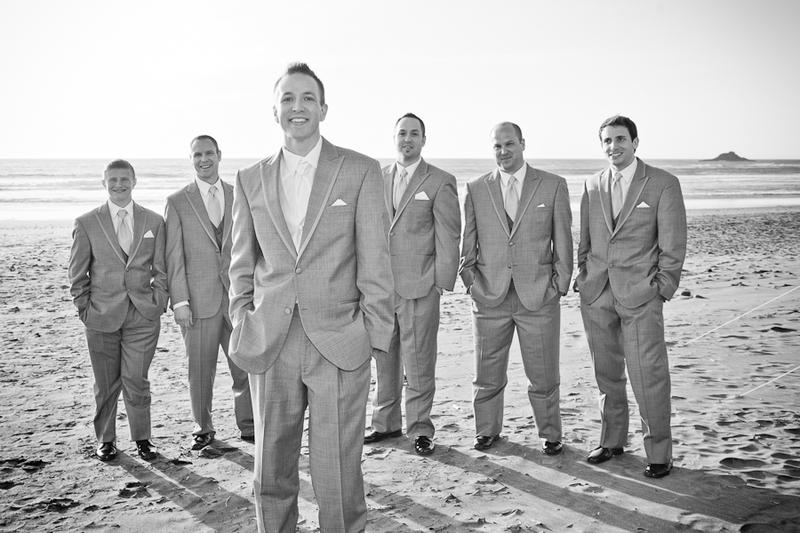 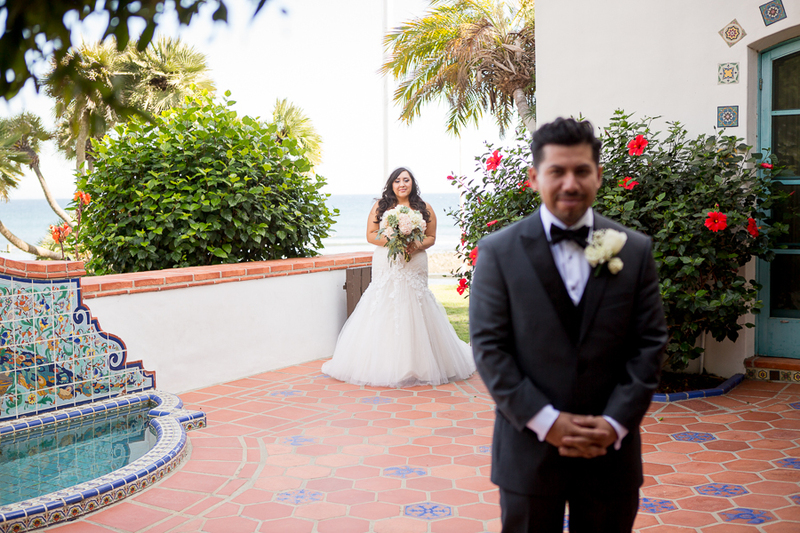 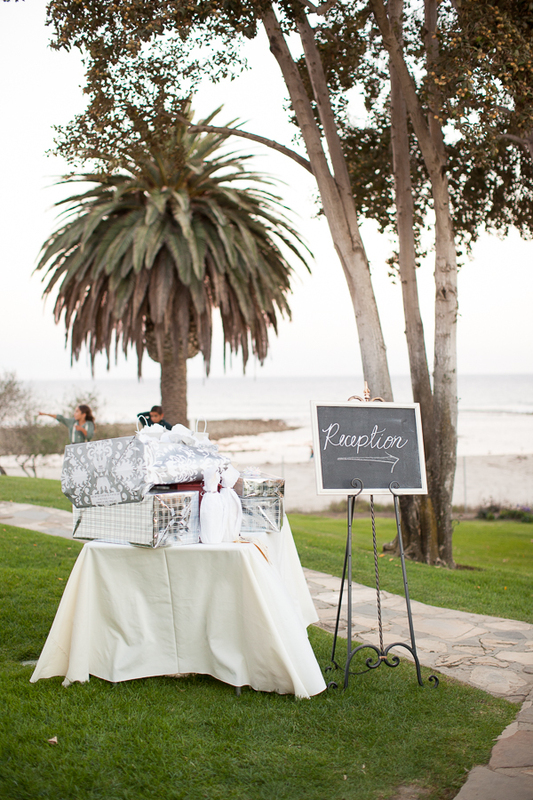 The ceremony took place on the beach, but the reception was held at the beautiful rental home Gables by the Sea. 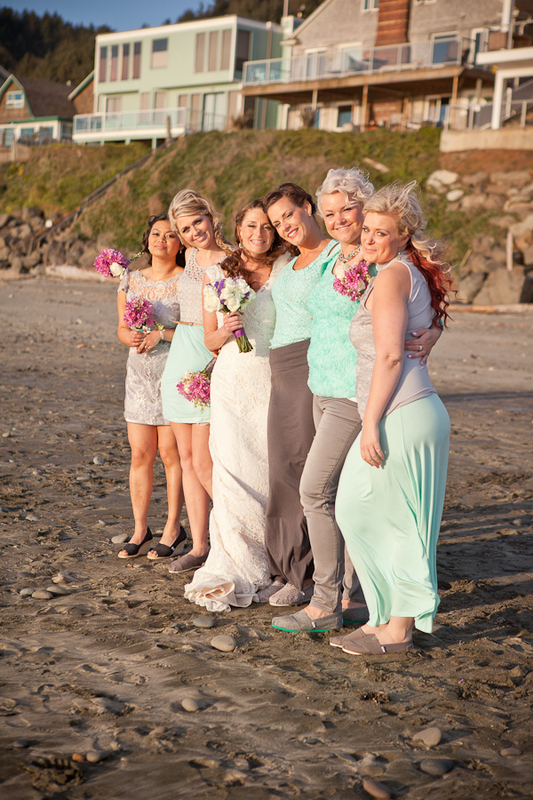 I loved that Wendy had her bridesmaids dress in their choice of dress or skirt, and just kept them to the same purple, grey, and sea foam green color palate. 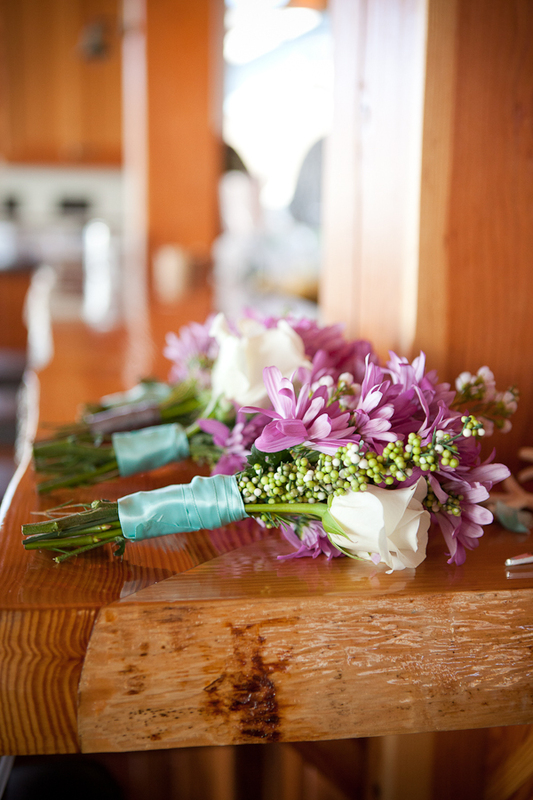 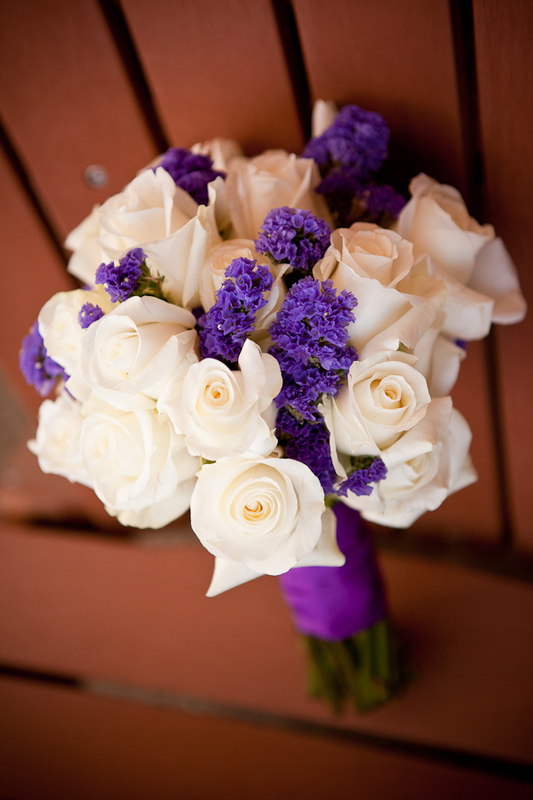 Most of the food and decor was put together by a friend of the bride and groom (a VERY impressive feat), and some of the bridesmaids helped assemble the bouquets of beautiful cream roses with purple flower accents. 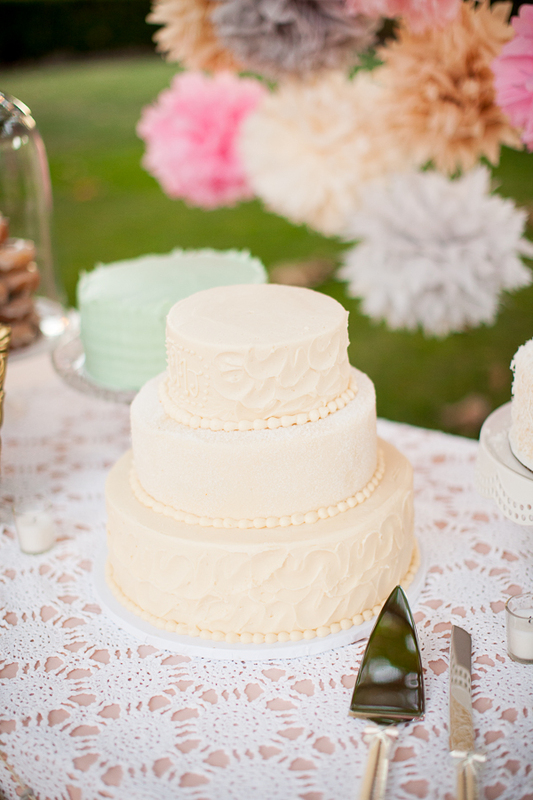 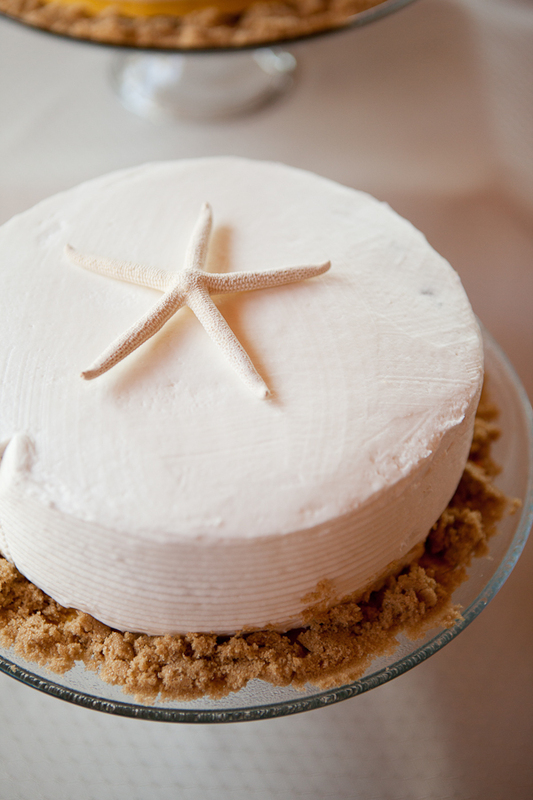 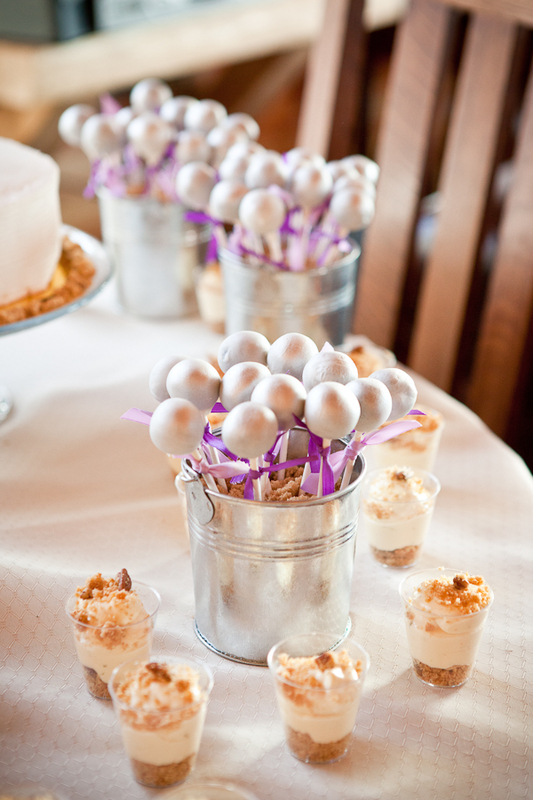 I really liked the starfish cake topper, and the brown sugar that was used as a garnish on the cake plates to mimic sand. 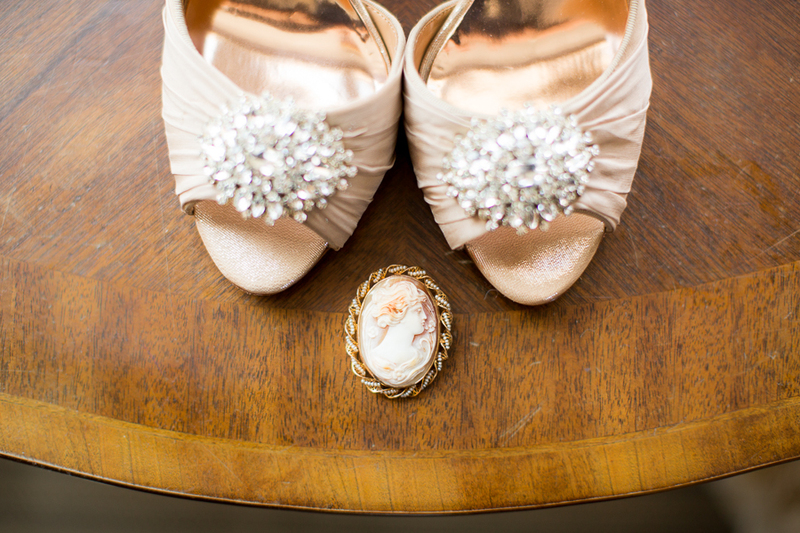 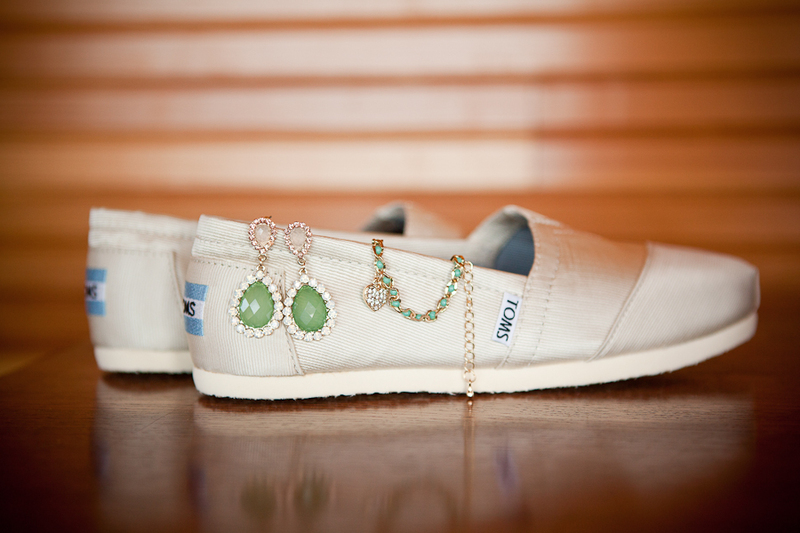 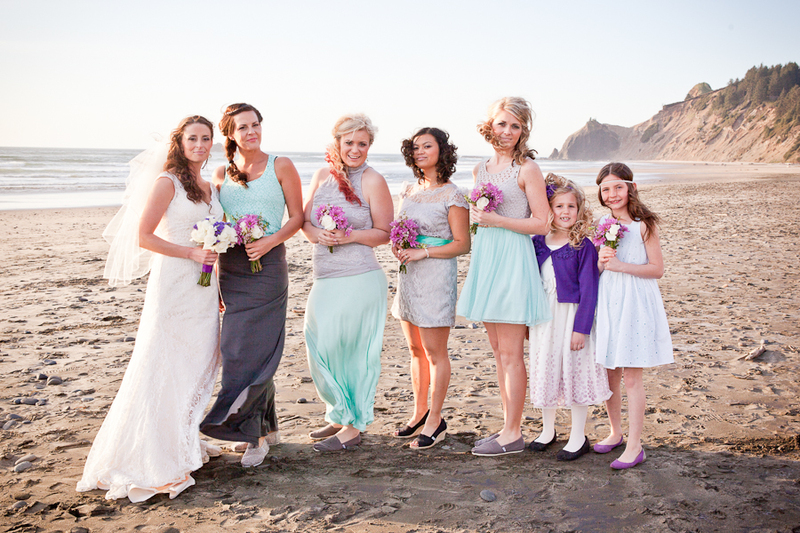 Wendy made a great choice in wearing a satin pair of cream Toms shoes for the wedding (much easier to walk on the beach in than heels), and the bridesmaids all wore Toms as well in their choice of colors. 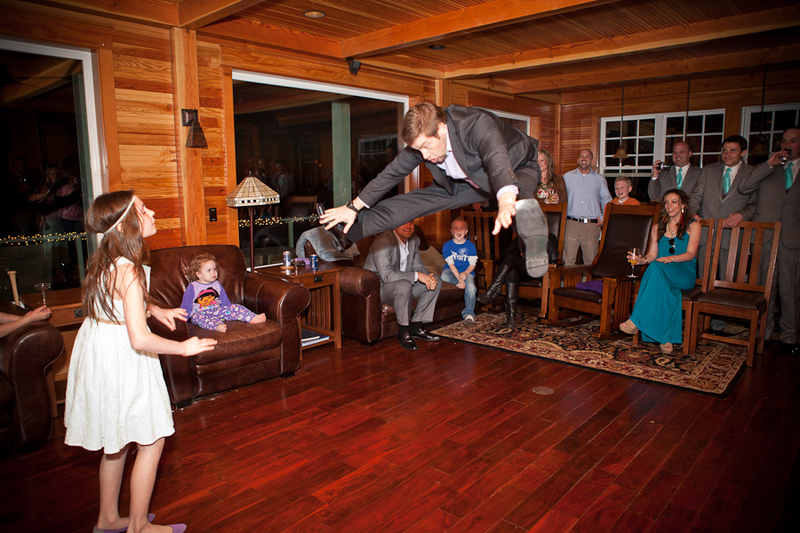 The evening moved on to some dancing (you’ll see an impressive toe touch by a friend in one of the pictures below) and I was able to steal the couple away during the reception for some sunset photos. 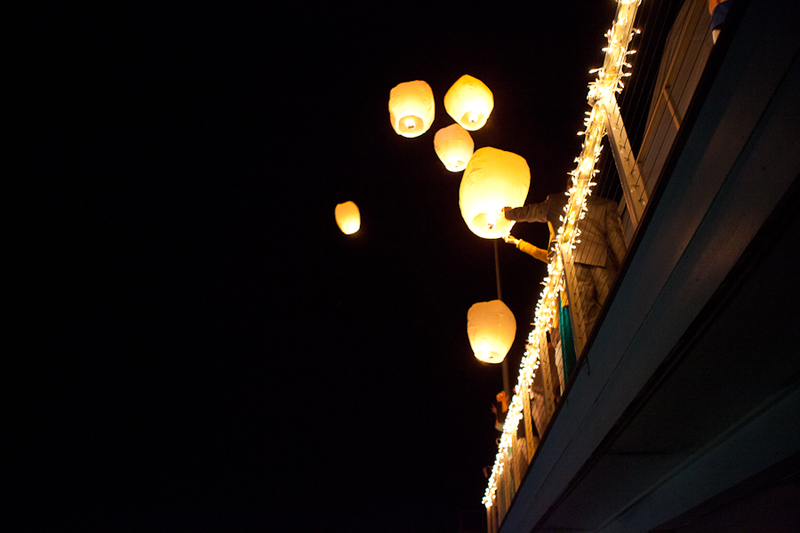 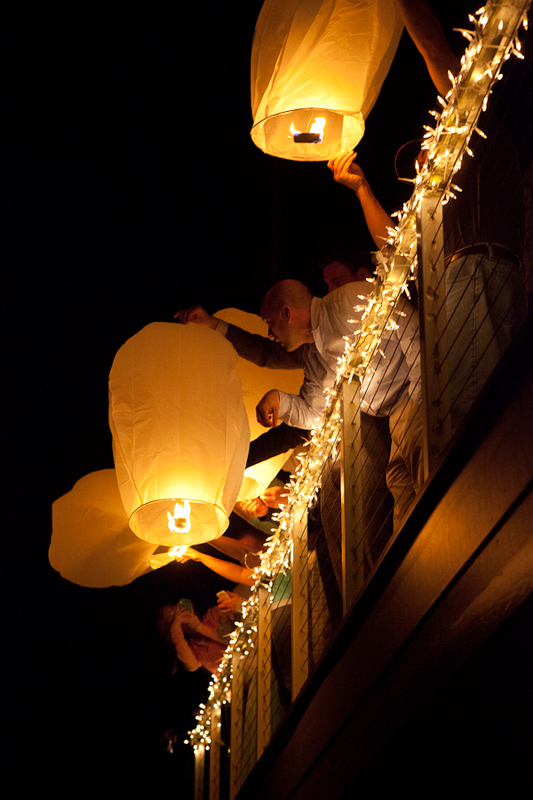 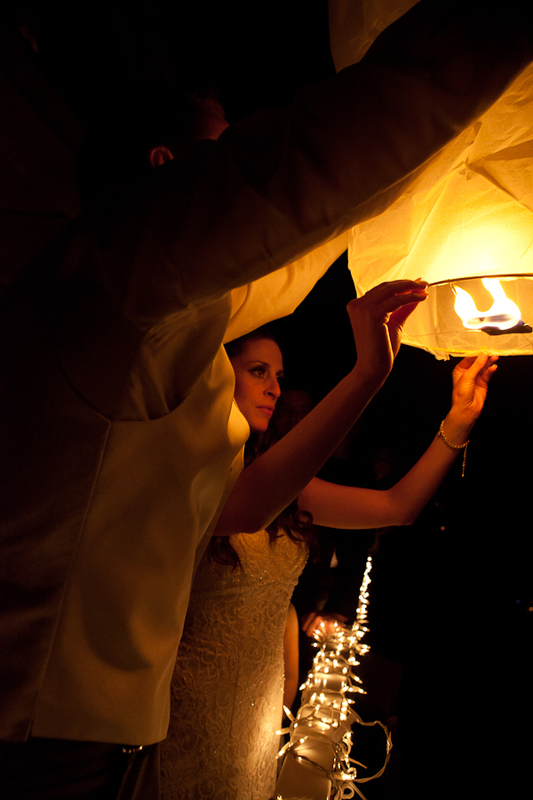 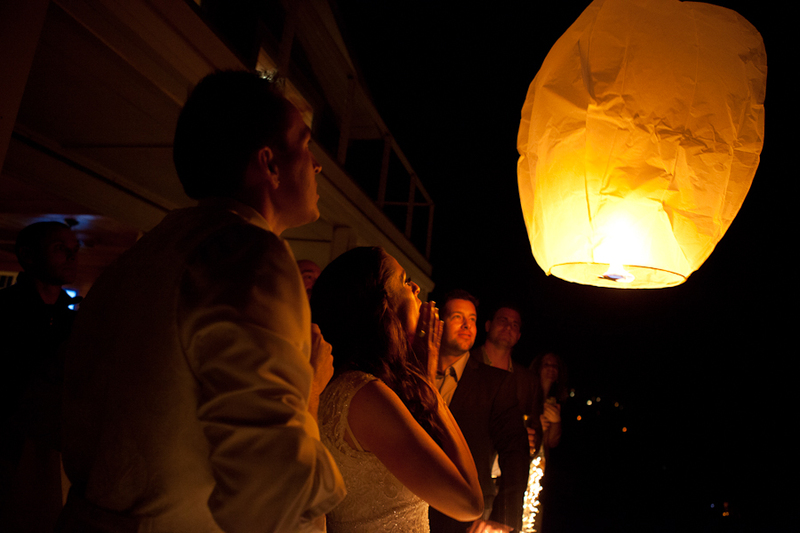 I also loved the paper lanterns that they lit and released at the end of the reception, a really beautiful end to such a wonderful day!